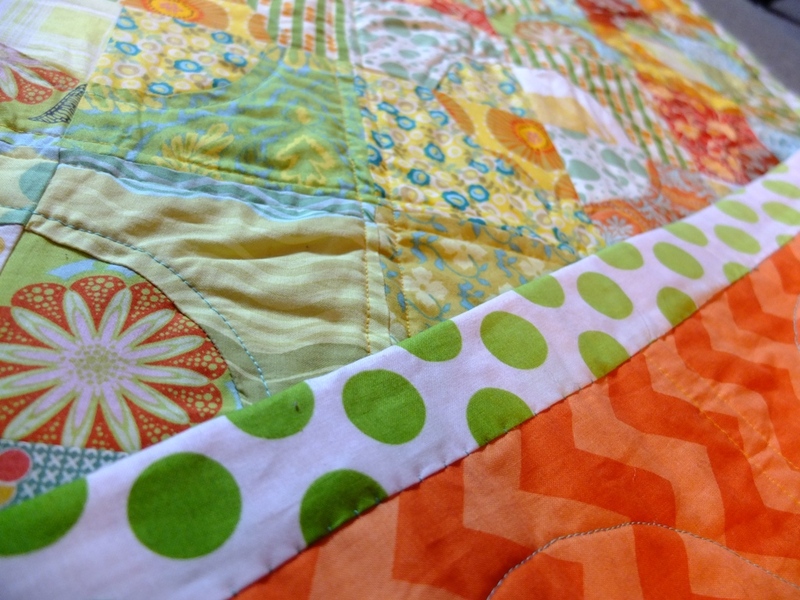 FINALLY after what feels like an age I have some finished quilts to post about! 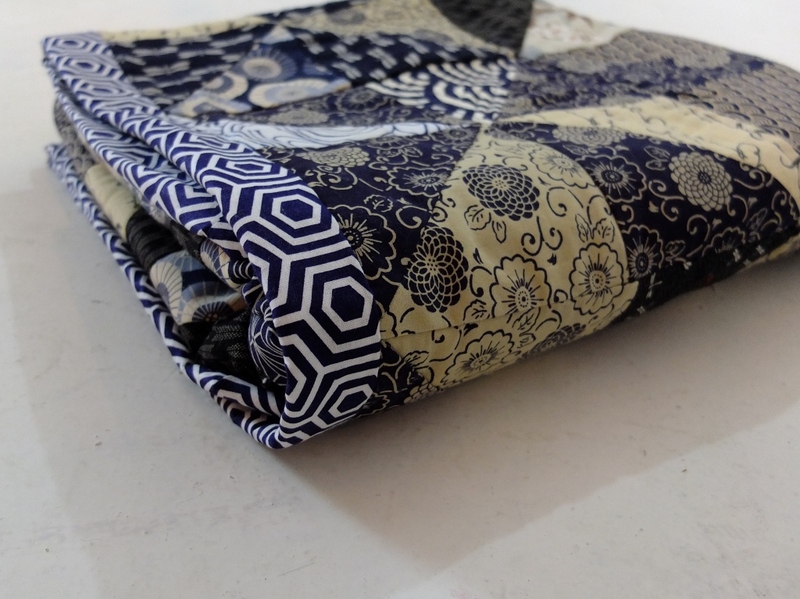 I polished off the binding on Indigo Pinwheels yesterday and finished the quilting of my lingering French Braid shortly after. 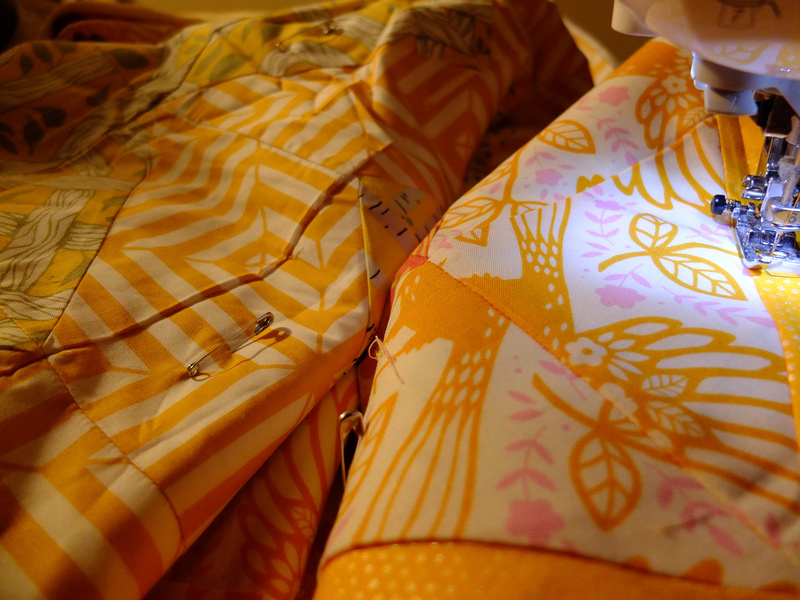 I decided that was close enough to finishing some WIPs to allow me to cut into some new fabrics. 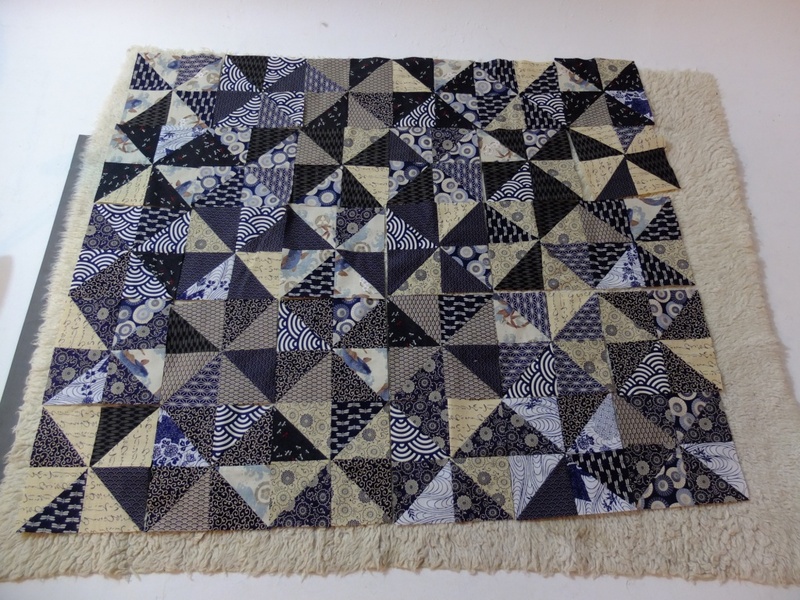 Here’s the finished images of Indigo Pinwheels. If you have a hankering to throw it over your own couch/bed/pet then it’s up for grabs. 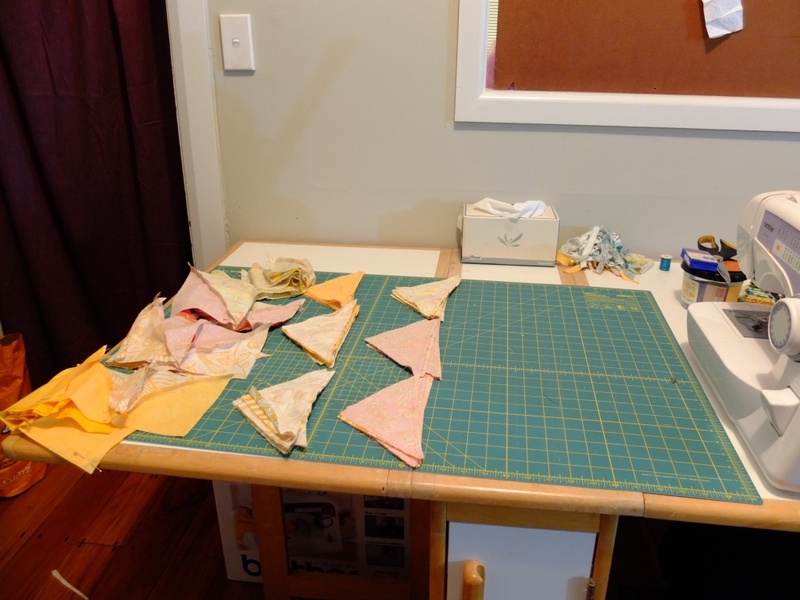 For the next quilts I’m making I’m using the rainbow gradient fabrics I mentioned in my last post, cutting stripes off each and sewing them together from greatest to least density of colour and then cutting an equilateral triangle out of the middle. 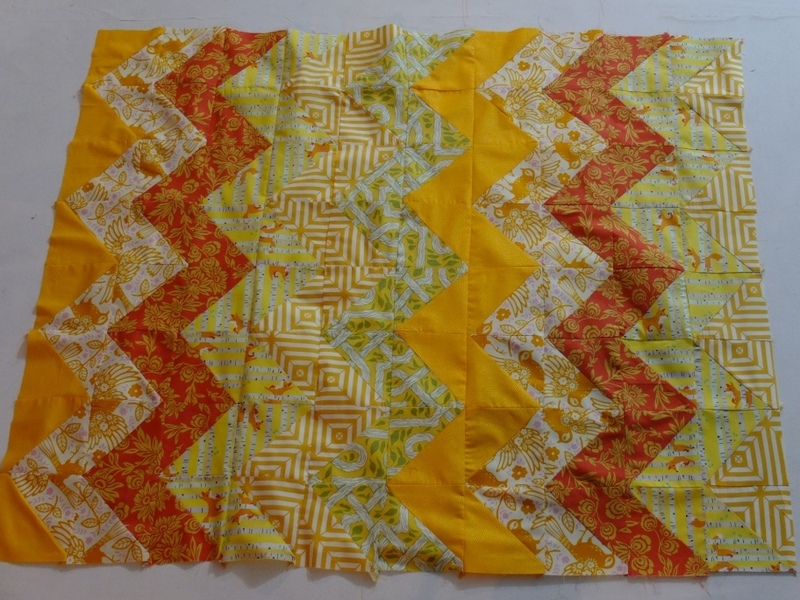 The way it’s set up should allow me to sew the offcuts together into a second triangle so from one set of cuts and sewing I should get two inverse quilts – one moving from darkest at the centre to lightest at the edges and the other the opposite. 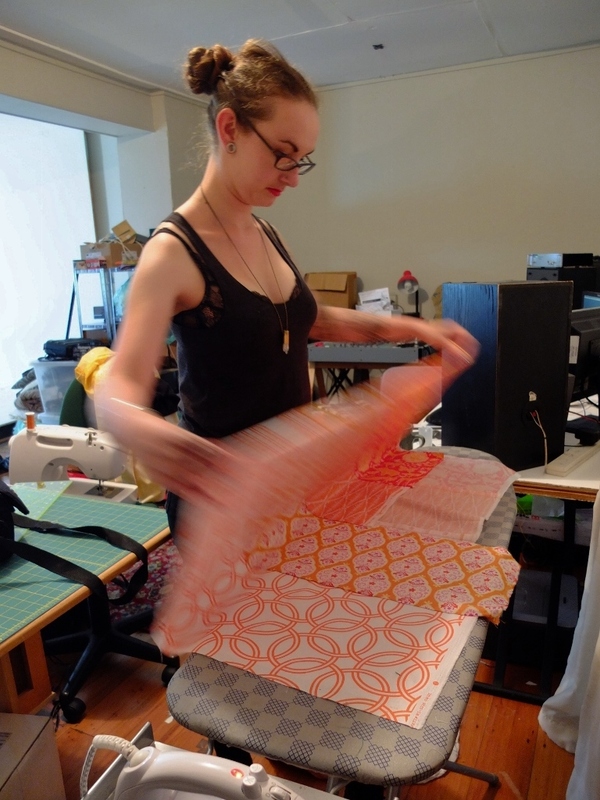 I have a couple of action shots thanks to my lovely partner who was working in his studio at the same time as I was in mine. 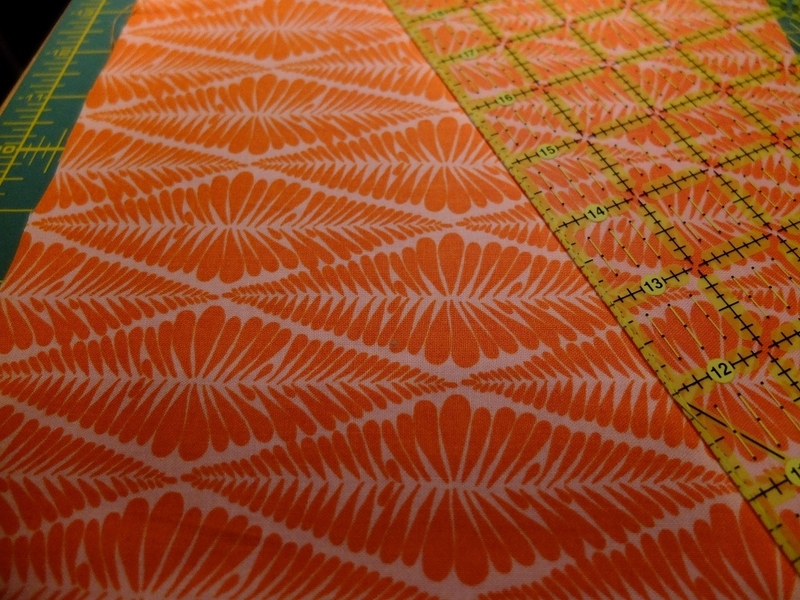 I think this is the first new quilt I’ve started since the Fair Isle quilt in November/December. 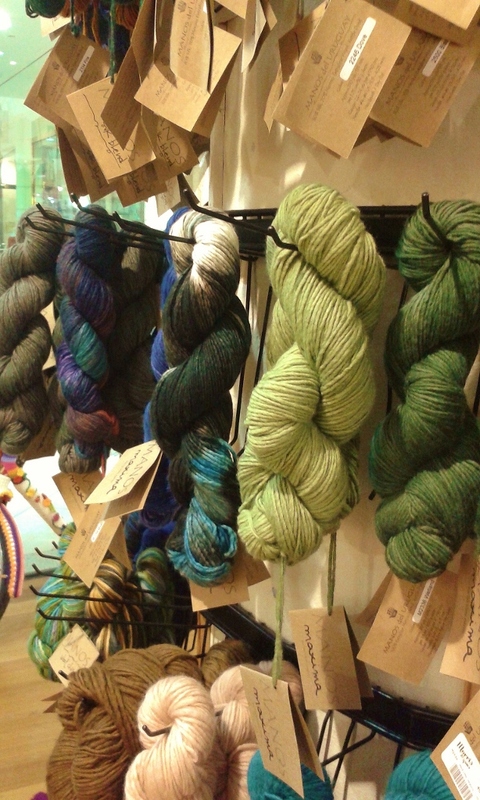 I’m enjoying working with such lush colours. 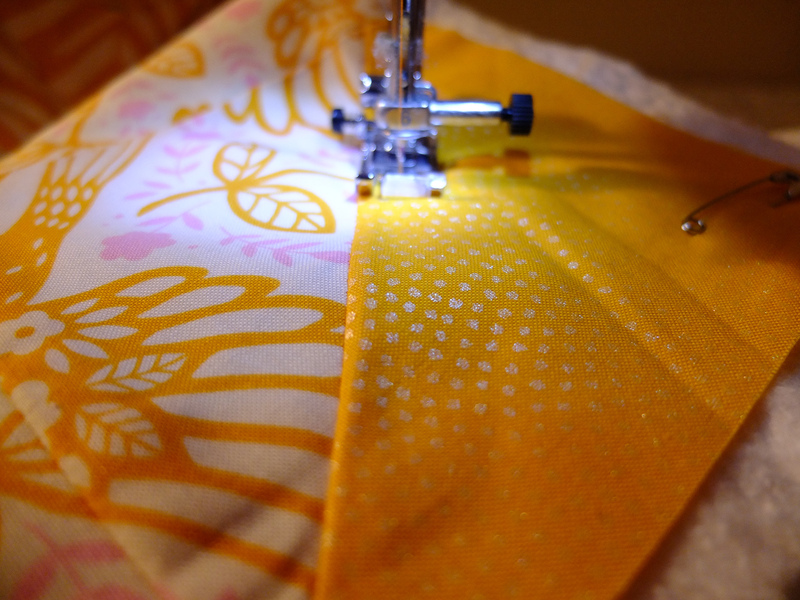 I had time to sew up the yellow and orange segments yesterday before I had to call time around 1am. Here are a couple of pictures to show you what I’m on about. 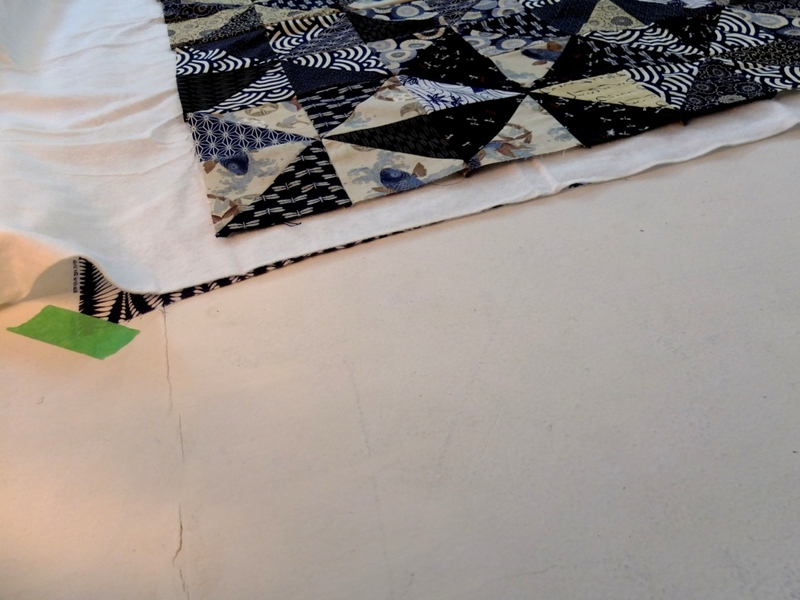 The finished quilts should be hexagonal, around 200cm across. 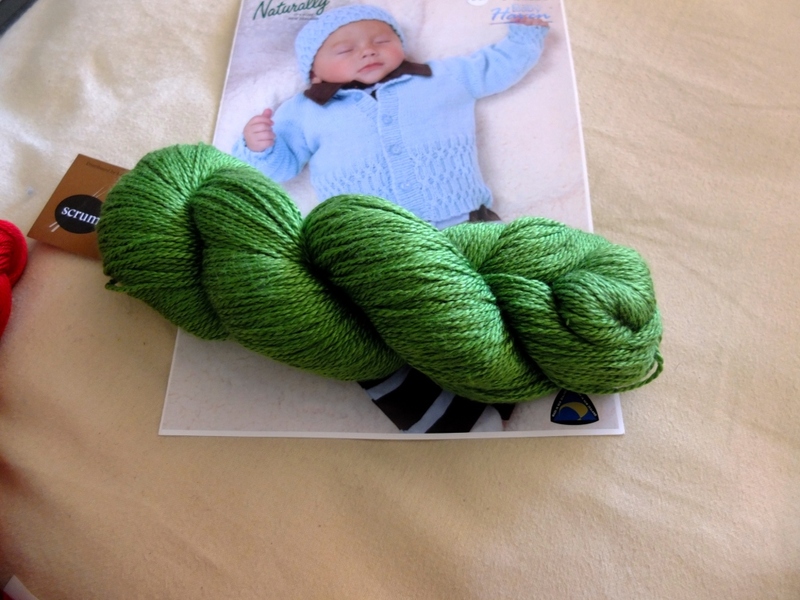 I’m still working on the baby cardigan I mentioned last time – knitting is for travel, I’ve decided. I can’t sit that still when I’m at home. I should have it polished off in the next day or two and then I have a hat planned with a scarlet cotton. 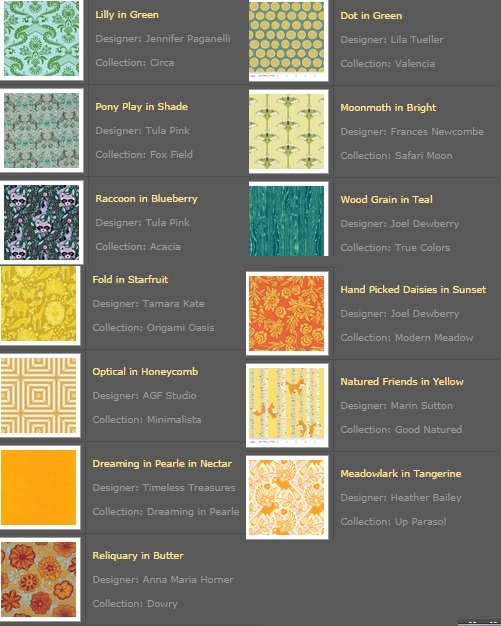 My quilts will wait until I get home again. 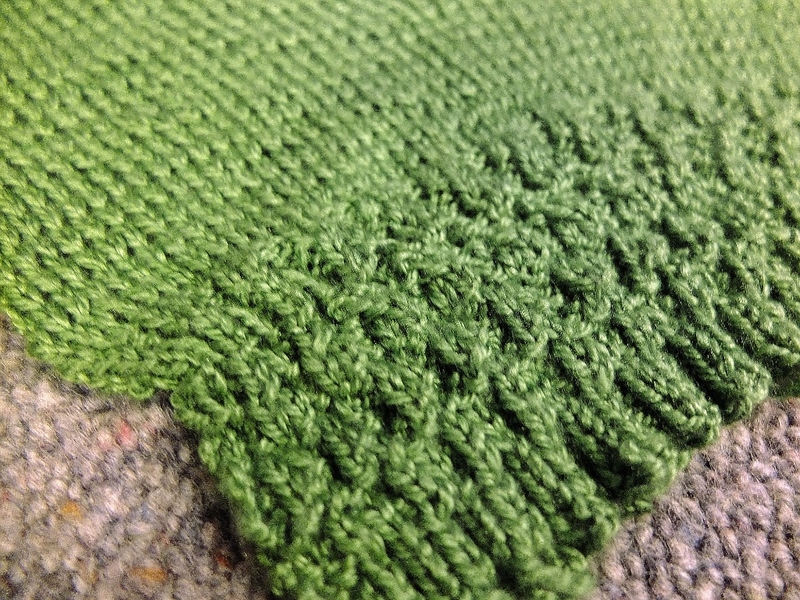 Quite accidentally everything I’ve sewn or knitted lately has been one of many shades of green. I can’t seem to shake it. I’ve started knitting up the baby jumper I mentioned in my last post. 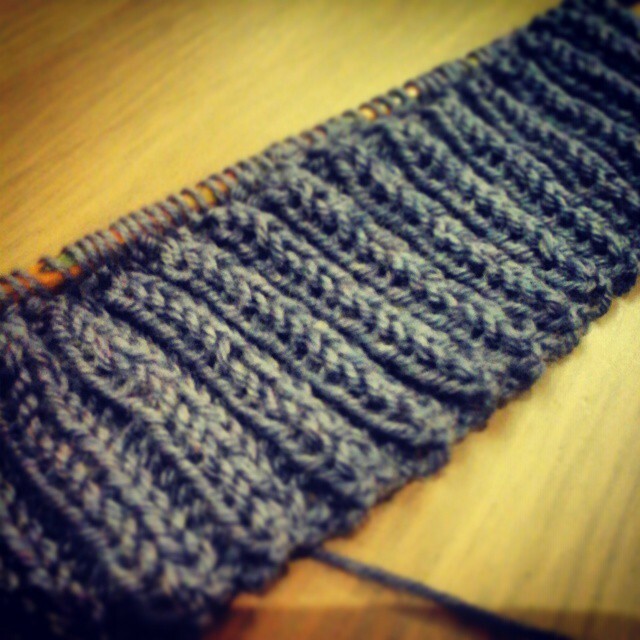 It’s coming together well – it’d been a while since I made anything that had stocking stitch in it and I forgot how quickly it knits up. 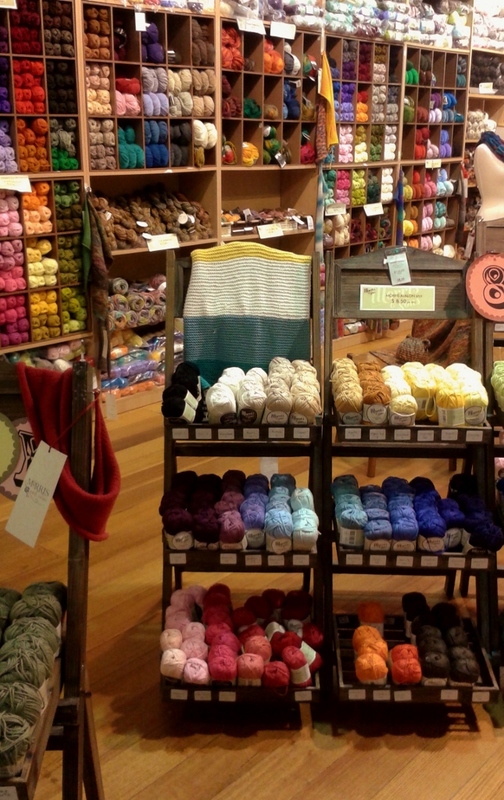 Most of this knitting was done in planes and airports – I got caught up in one of Melbourne’s famous storms and spent 2 hours sitting on a runway. 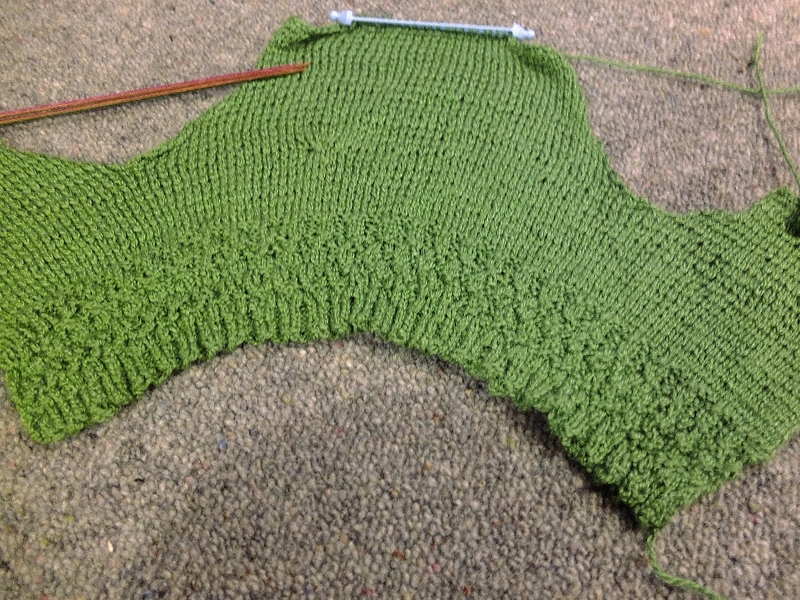 Time flies when you’re almost finished the back of a cardigan though. 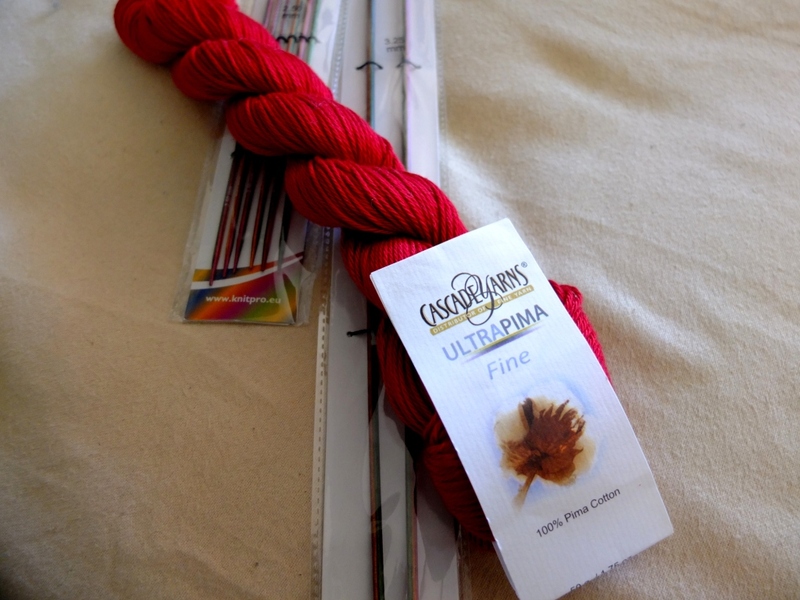 Now I’m just knitting up the sleeves and swearing never to knit on anything smaller than a 3mm needle again. 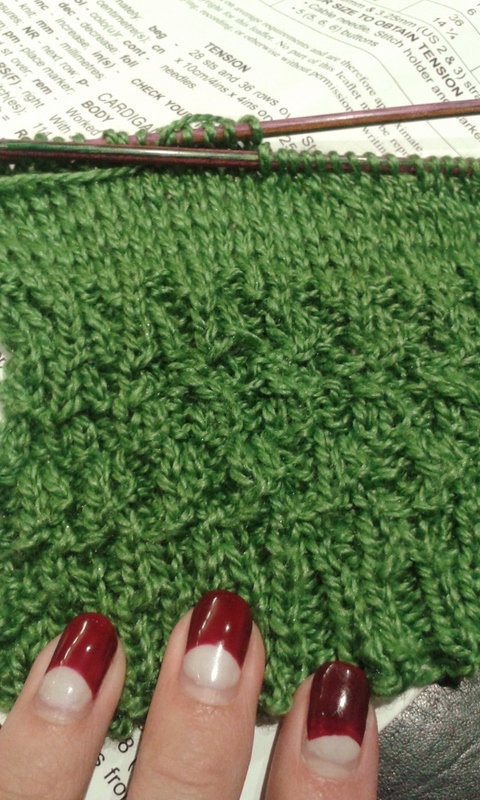 The sleeves of this are knit on a 2.5mm and I constantly feel like I’m about to bend the needles in two. While I was in Melbourne (before the skies opened and conspired to keep me stuck at the airport forever more) I stopped by Morris and Sons to get the wee little needles – I couldn’t find any in that size for love nor money in Wellington before I left (at least not without going off to dig through second hand stores). 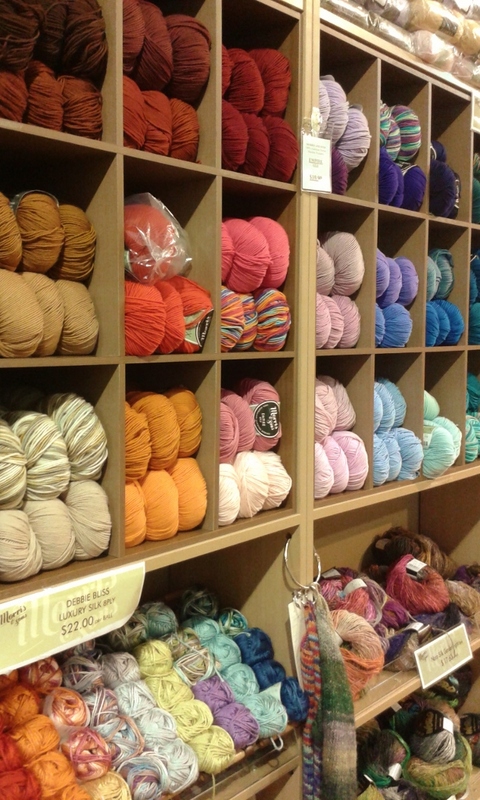 I love Morris and Sons – they have this gloriously light and airy feeling store with shelf upon shelf of yarn arranged by colour. 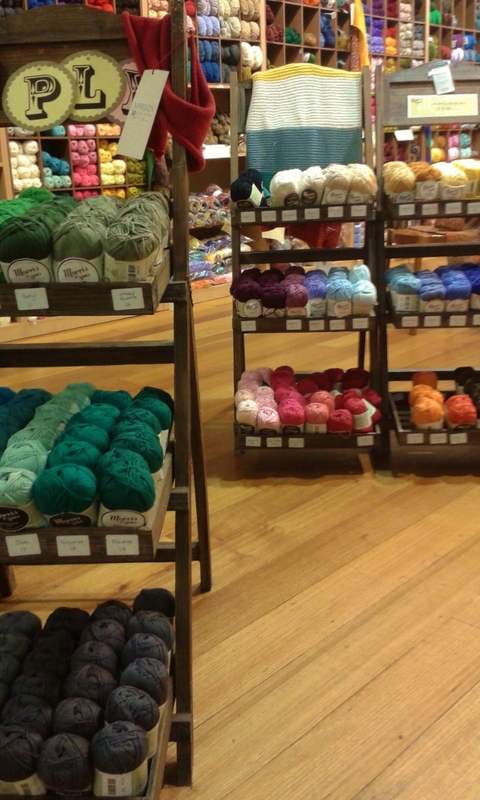 My love of rainbow colour gradients is pretty well documented and being in their store is like having some deep part of my brain thoroughly massaged. 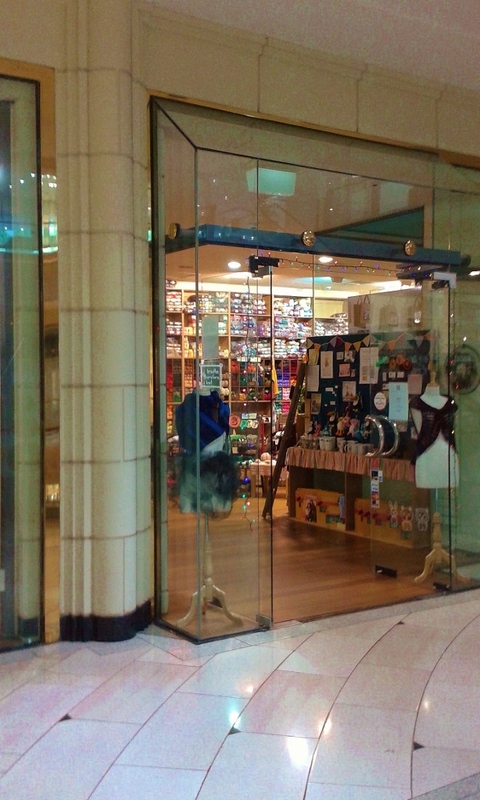 I snapped a few photos while I was in there – only on my phone, so they don’t really do it justice – but still enough to capture some of the lovely warmth of the store. 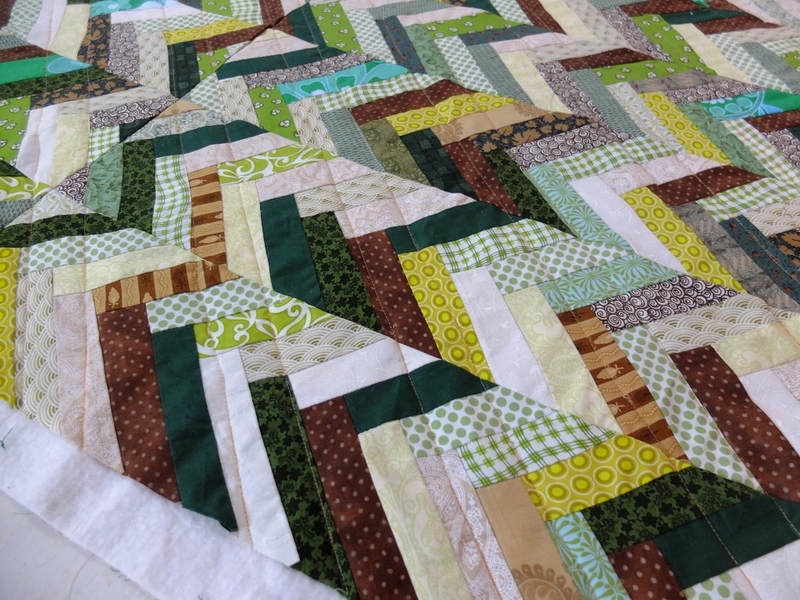 The other greens I’ve been working with have been the green and brown chevron quilt top I’ve been finishing off as part of my dedication to ploughing through my WIPs. 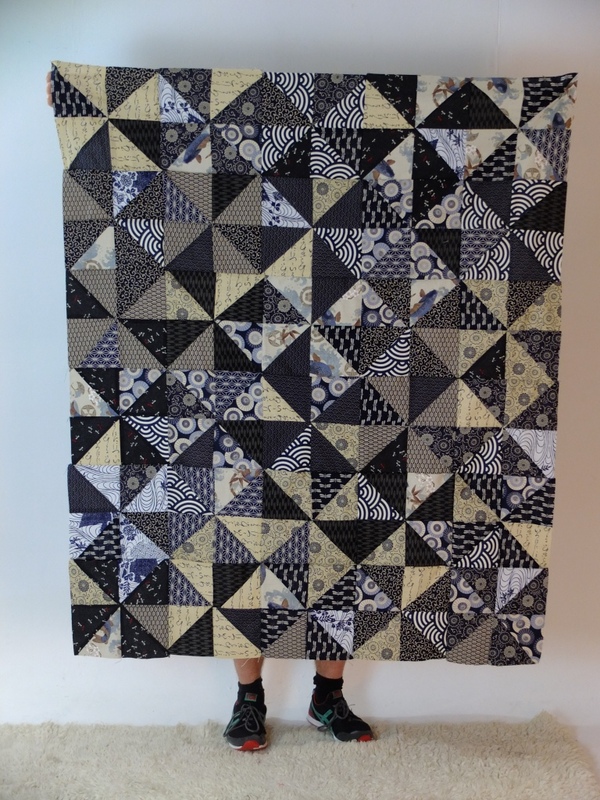 To be honest I was a bit uninspired by this top when it was just individual blocks, but now I’ve pulled it together into a full quilt top I’m liking it a lot more. 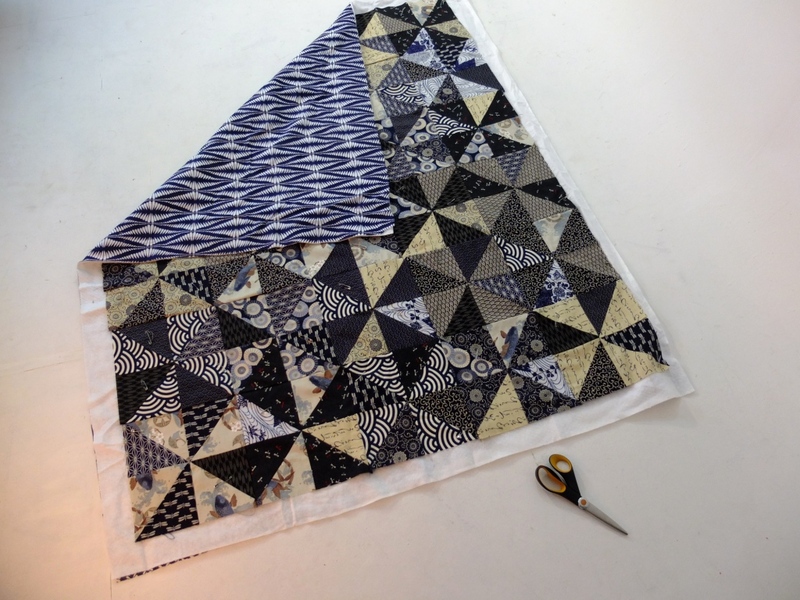 The final version is only going to be a wall or lap quilt – it should be around 48″ by 36″ and I’m quite looking forward to something which should come together so quickly. This and the pinwheel quilt I’ve been blogging about are both going to be up on my Etsy store when I’m done – although if you’d like me to hold one for you just shoot me an email (contact AT fukitu.com) and I can arrange that too! 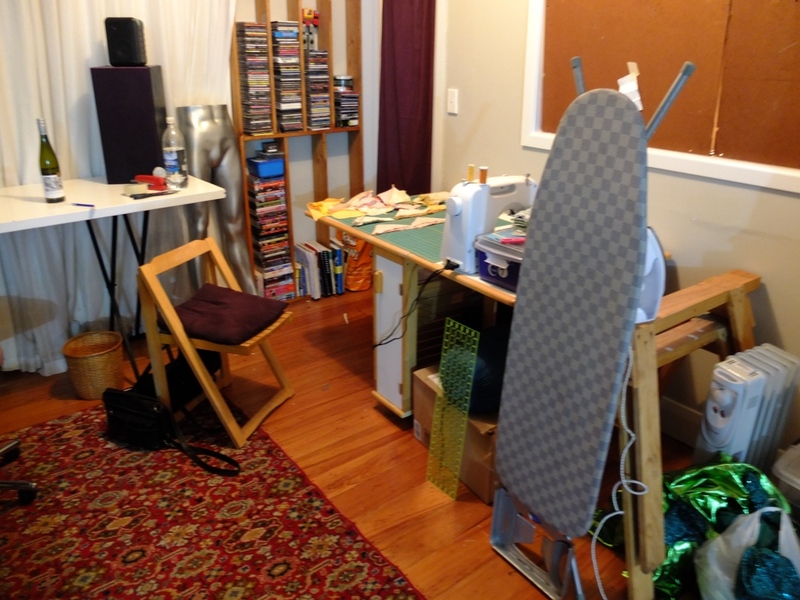 In less good news, I have to move out of my studio which I’m a bit heartbroken about – I love it, but the landlord is putting up the rent by more than we can justify paying (I share it with my partner.) 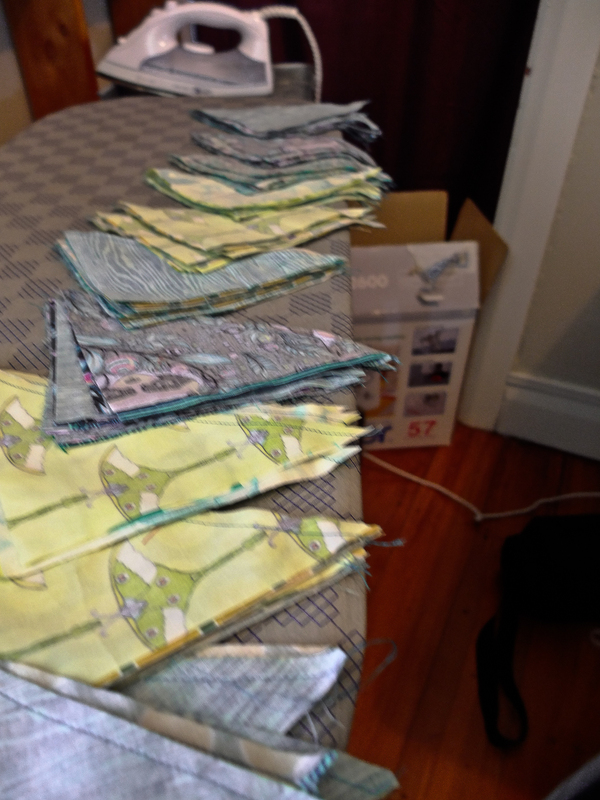 I’m hoping something else comes along soon, because I don’t miss having quilting projects strewn across the lounge. 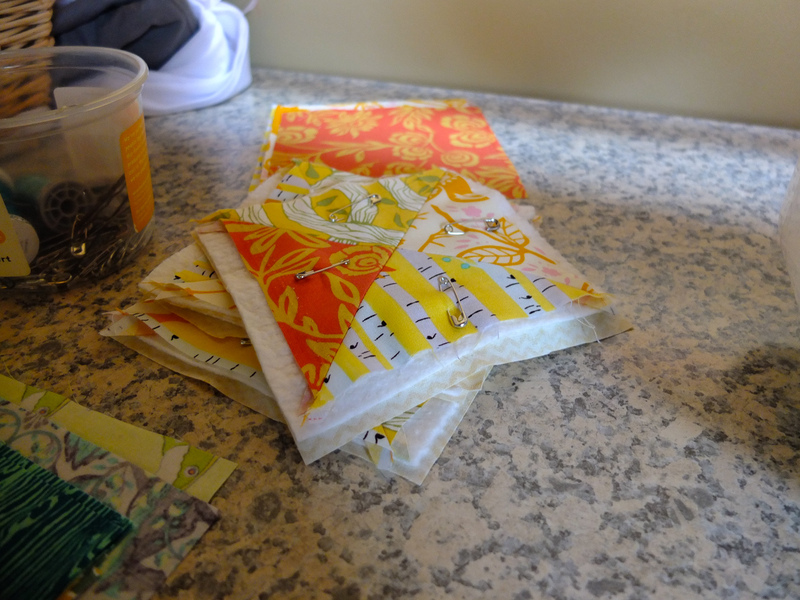 I’m using this as a reason to be fairly brutal about which WIPs I think I will actually finish – moving back out is going to put space at a real premium so I’m trying not to hold onto half finished projects which I don’t have a hope of completing. 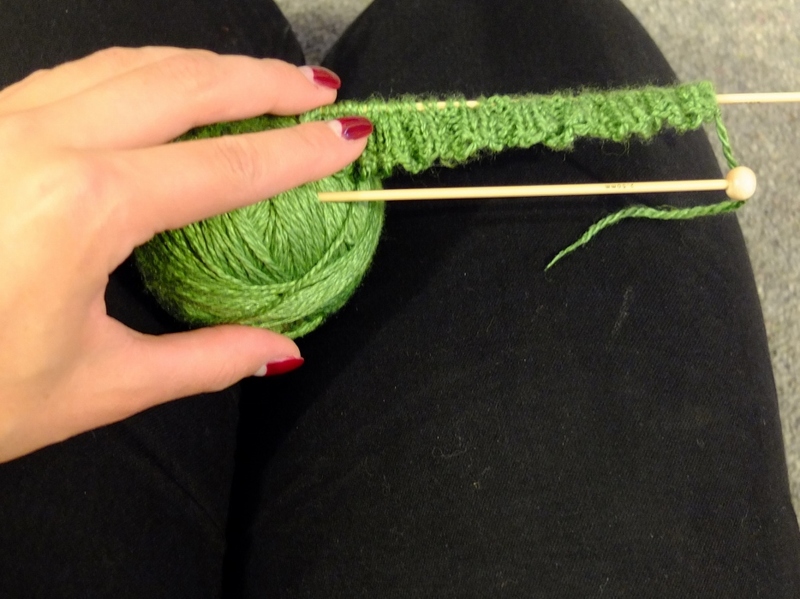 What are other people’s thoughts on abandoning WIPs? 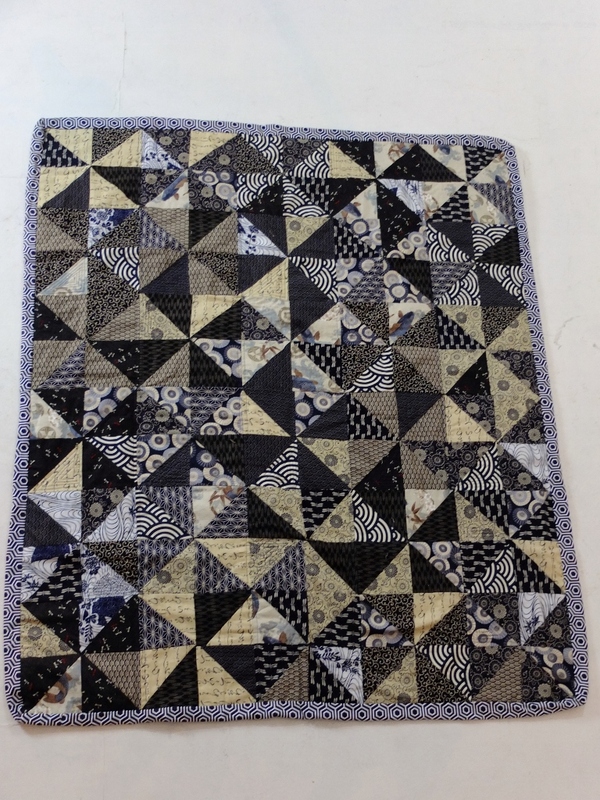 I personally find it hard to let go of something I’ve invested so much time in, but there are some quilts where I can really see that my skill level has progressed so much that it’ll be quite obvious the quilt was completed over a fairly long time period. One last picture before I take myself off to bed. 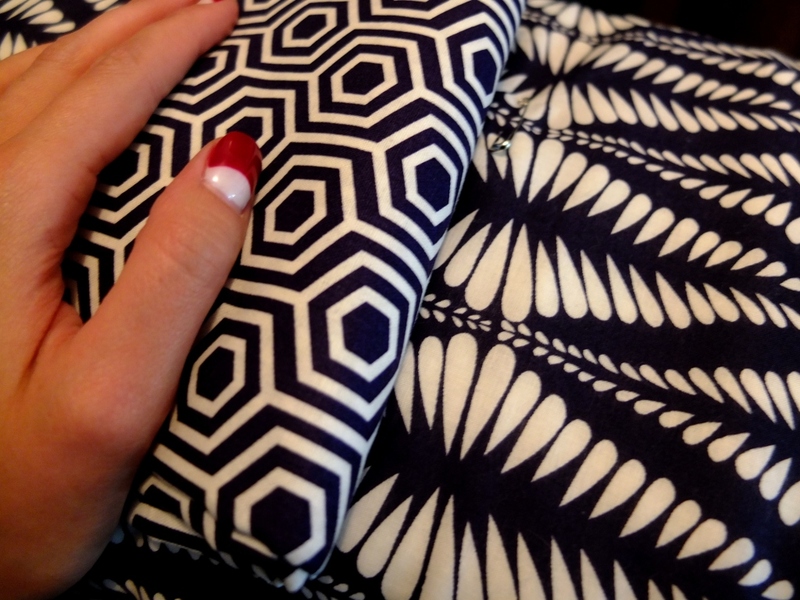 I went a bit wild on the Hawthorne Threads website a few days ago and lo and behold, my parcel has already arrived! I’m pretty impressed – six days to be packed, shipped and arrive on the other side of the world is no mean feat. 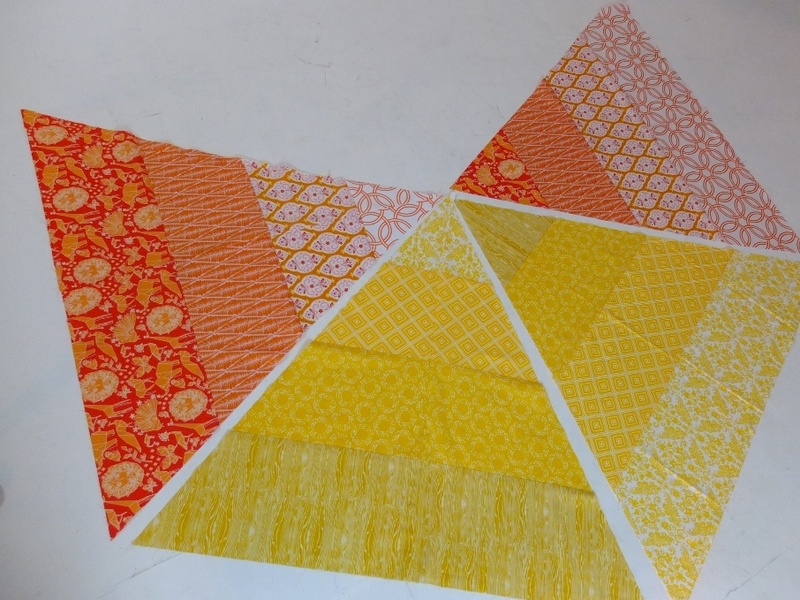 I was quite inspired by a lot of the Quiltcon images I saw on Instagram and decided to make my next project a colour gradient hexagon queen bed quilt – I did some preliminary sketches and I think this fabric should be enough for 2-3 quilts all in slightly different configurations. I’m banning myself from cutting into it until these WIPs are finished and listed in my Etsy store. The struggle is real. 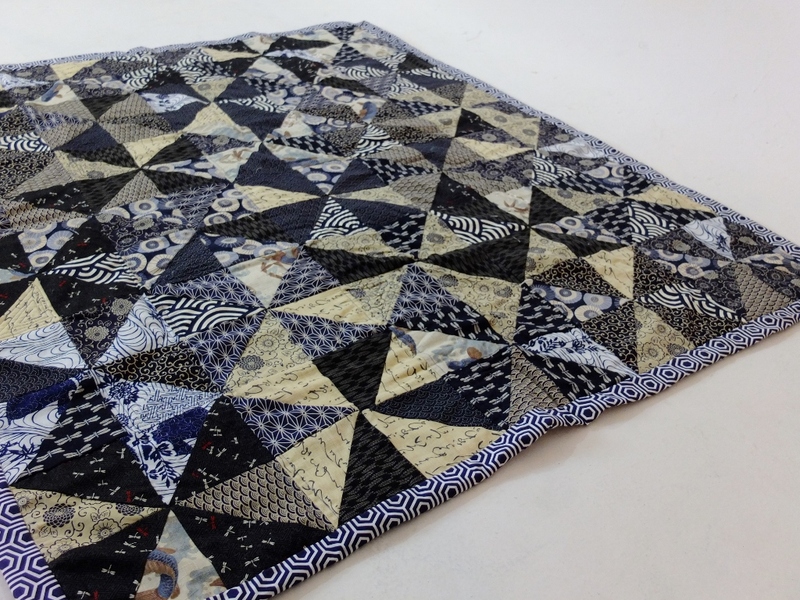 I’ve been mulling this post over in my mind for ages and I’m still not 100% sure how to lay it out, but since I’ve been posting updates on my Indigo Pinwheels quilt which includes Japanese cottons as the main element I felt like it was timely. 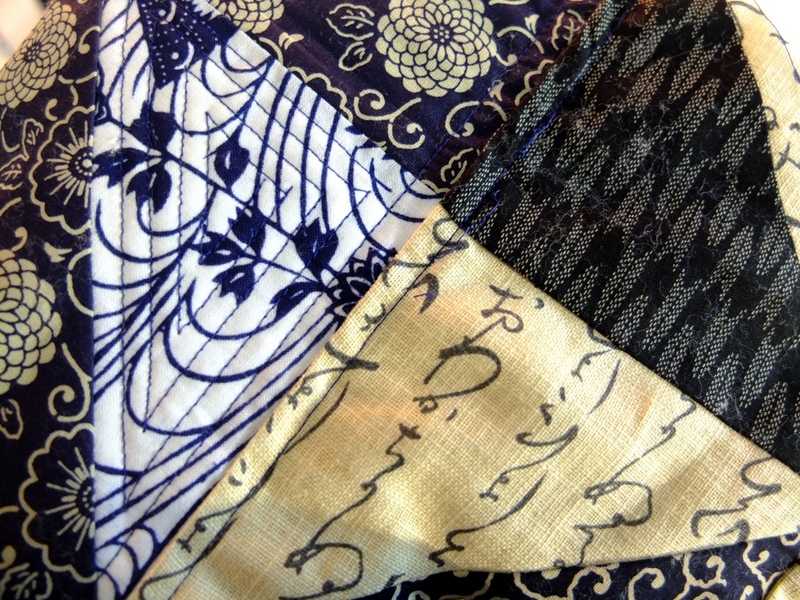 I’ve been thinking a lot lately about if it’s appropriate for me as a white woman to use fabrics which come from other cultures in my quilting. 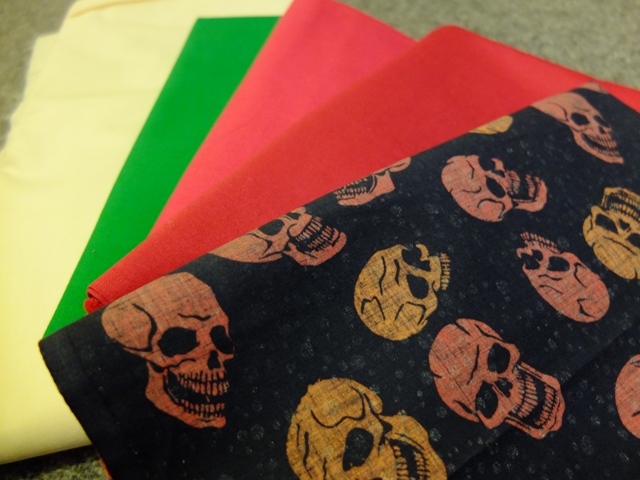 I know already that quilting has a problem with cultural appropriation – when I was looking, just as one of many examples, for a fabric with a skull print I kept being referred to fabrics with sugar skulls on them. There are already plenty of links which explain in detail why the Sugar Skull is culturally appropriative, especially used in this way – decorating a bolt of fabric, removed from its context, history, a time and place and with no acknowledgement of the history behind it. 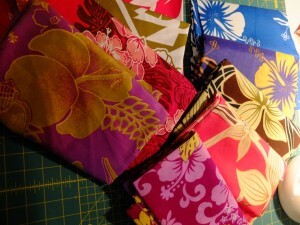 Personally, I’ve used recently some Japanese quilting cottons in my quilting, and a few months ago I visited Western Samoa and bought some lengths of fabric while I was there, including some Elei fabric (a style of printing traditionally used to decorate tapa cloth and more recently used on other fabrics) and some patterns which various people there told me are sometimes called Samoan but are more correctly identified as Hawaiian influenced. 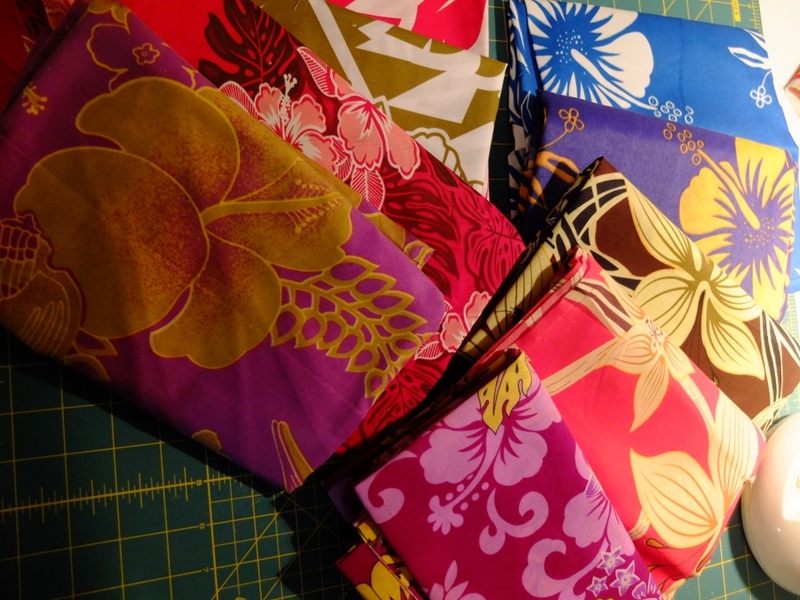 I think the main things I am considering are if there is a respectful way I can incorporate these fabrics into my work, or if it is inherently appropriative to use these fabrics from another culture in my sewing. I think the questions of Japanese and Samoan fabrics need to be considered separately. Among the things I want to think about (and I want to stress I am constantly growing and developing in my understanding, so if someone wants to correct me on this and has the energy to do it I would be only too grateful) are the relationship that my culture, as a white New Zealander has to the culture the fabrics come from, if the ways I am obtaining the fabrics materially benefit people from the culture they come from, crediting the origin of the fabrics appropriately and if they are being used in an appropriate way. 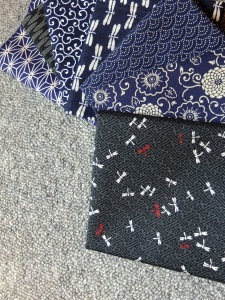 To be honest, I am more comfortable using Japanese cottons for a few reason: Japan has a history of quilting – including Sashiko quilting (a form of stitching reminiscent of many contemporary Japanese quilting cotton patterns), so I feel as though using the cottons in this way is appropriate to their intended and historical use. Also, New Zealand’s relationship with Japan doesn’t have the same colonialism inherent in our relationship with Western Samoa. 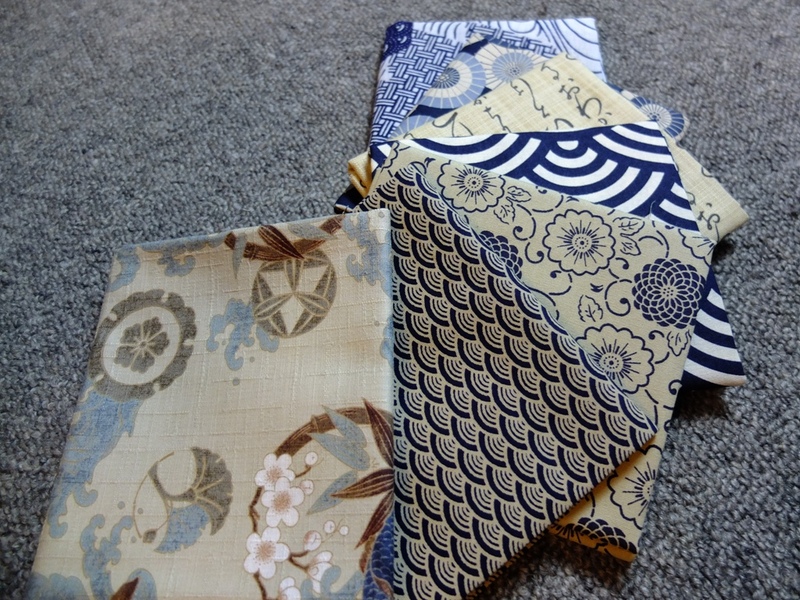 Also, when I buy my Japanese cottons I try to buy them from stores either based in Japan, or owned by people with Japanese heritage so the proceeds from the sale of them are going to people with some relationship to the history of the designs. 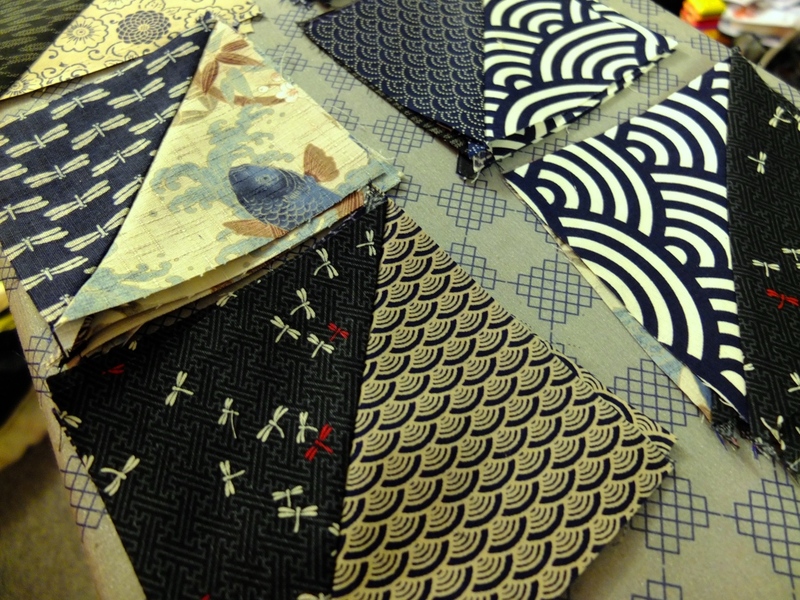 It doesn’t, and I’m aware this is a fairly nebulous way of putting it, feel appropriative to use the fabrics in this way because it is aligned with the use for which they were produced and my buying them feeds back into the economy of Japan. 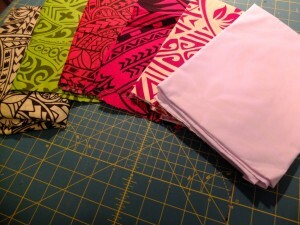 I’m more conflicted about using fabrics from Samoa. To start with, as far as I have been able to tell from my research, Western Samoa doesn’t have a quilting culture – American Samoa has some, largely introduced by missionaries. 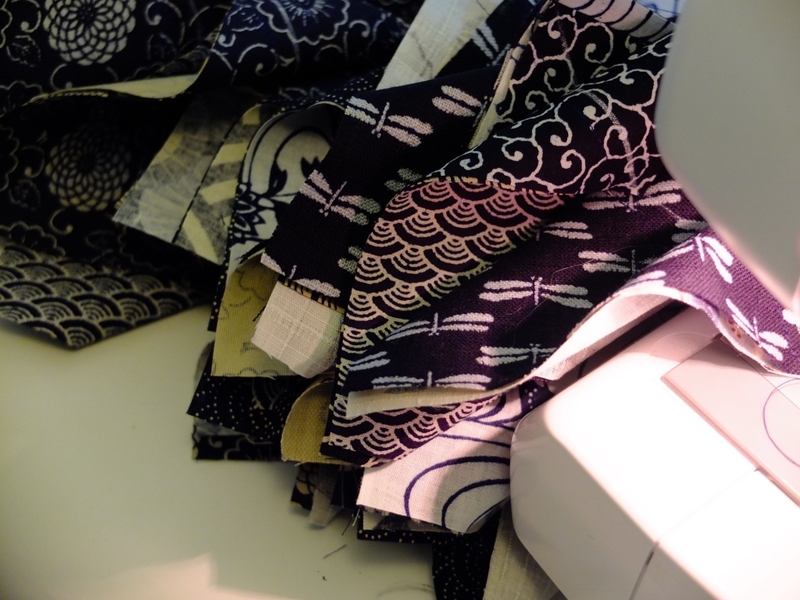 So the fabrics I have wouldn’t have been created with that end use in mind – I think that as uses go quilting is fairly benign, but I would still prefer to use fabrics in a way aligned with their intended use. 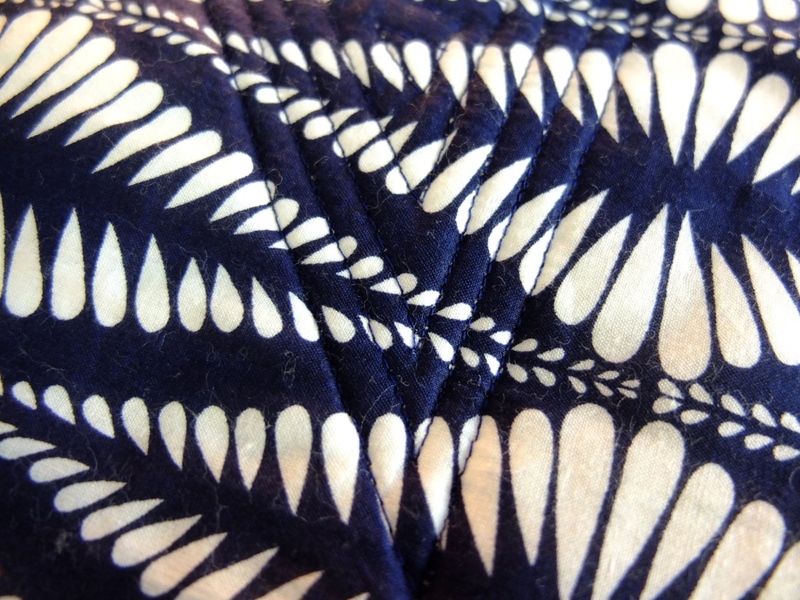 Also, Samoa has a history of being subjugated by New Zealand and I’m very aware of this imbalance of power when I consider if I have a right to use Samoan fabrics in my quilts. Samoa has only been independent from New Zealand since 1962, and New Zealand’s history with Samoa contains incidents like the Black Saturday shootings and the grossly racist Dawn Raids. It feels a lot more like the classic definition of appropriation – co-opting an attractive part of a culture without having to deal with the negative parts of having that identity (the poorer education and health outcomes Pasifika people experience in New Zealand because of systemic racism). 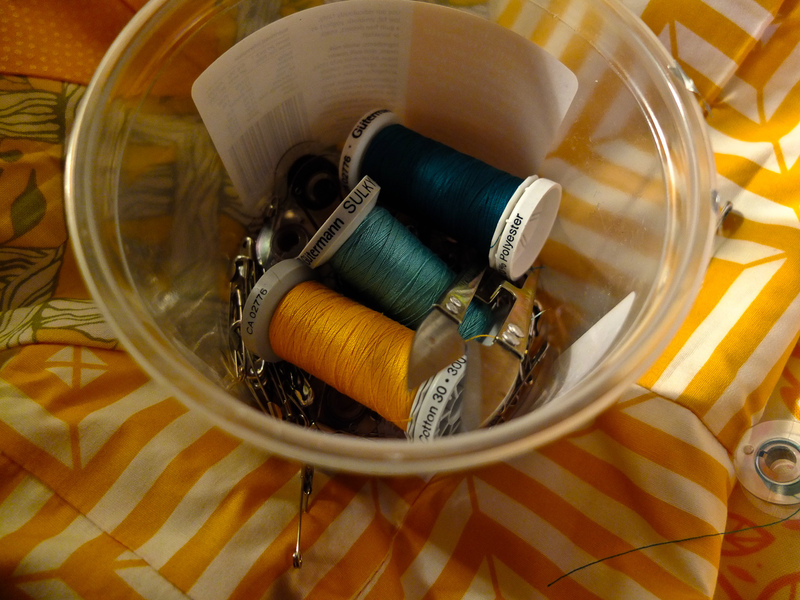 For now, I’m keeping the fabrics in my stash because I don’t want to discard them and feel wasteful. 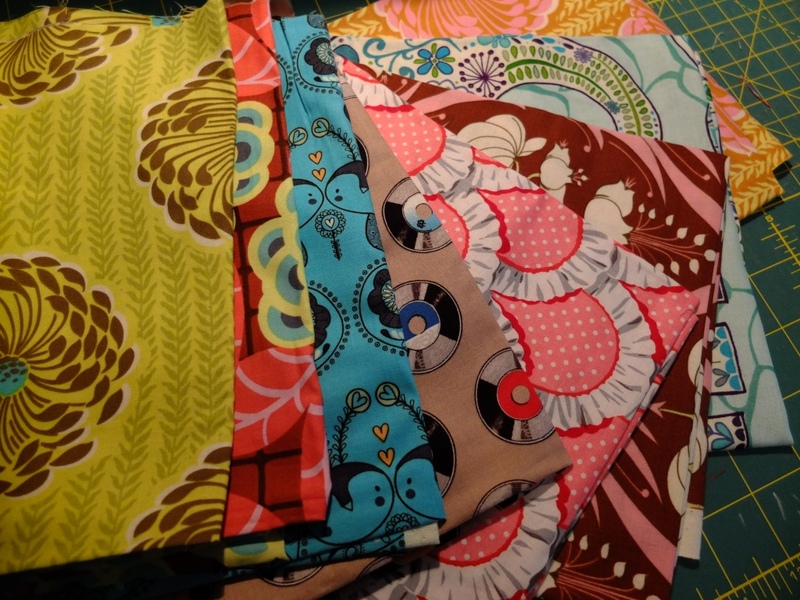 One thing I am considering doing in the future is making a quilt from some of them and donating some of the proceeds from it to a Pasifika Womens Refuge or advocacy group. 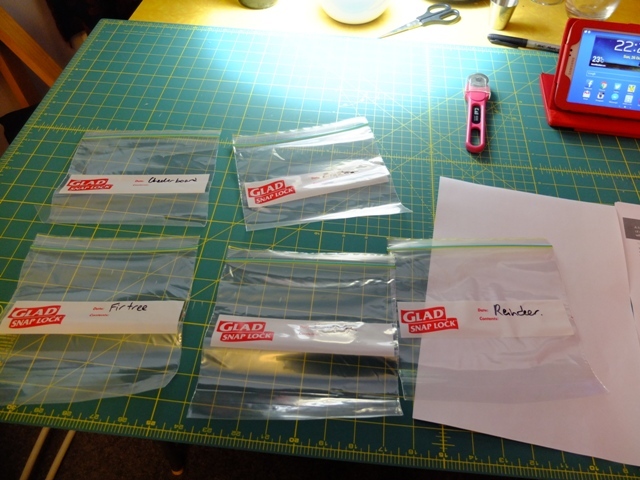 I’ve spent the last week working on some WIPs, trying to get them knocked out before January is gone – now I’m in my new studio I have one large plastic box which I’m keeping WIPs in and attempting to limit myself to only as many as will fit comfortably in it. 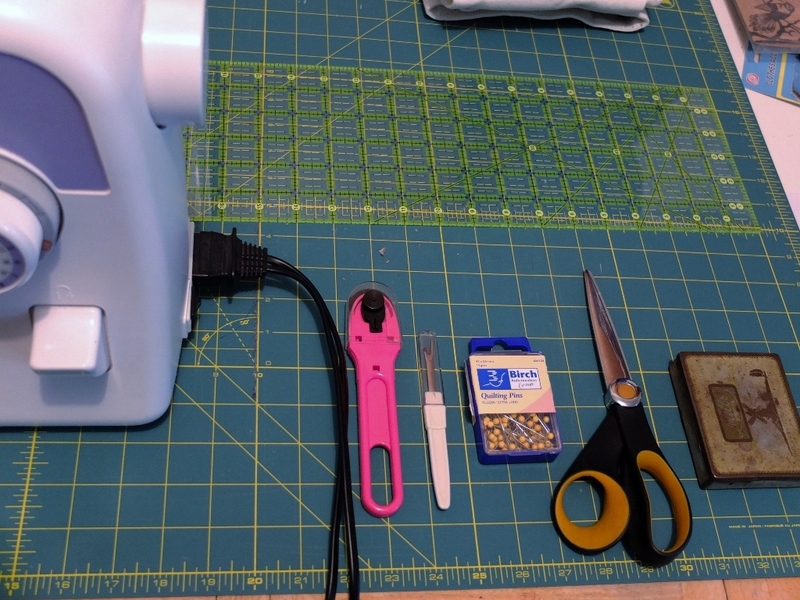 So far it’s a very effective system – my desire to always be working on something new has been beaten out by my desire to keep things pleasingly streamlined and tidy. I figure if I can knock out one of the blocks each month it should be ready in plenty of time for next Christmas. 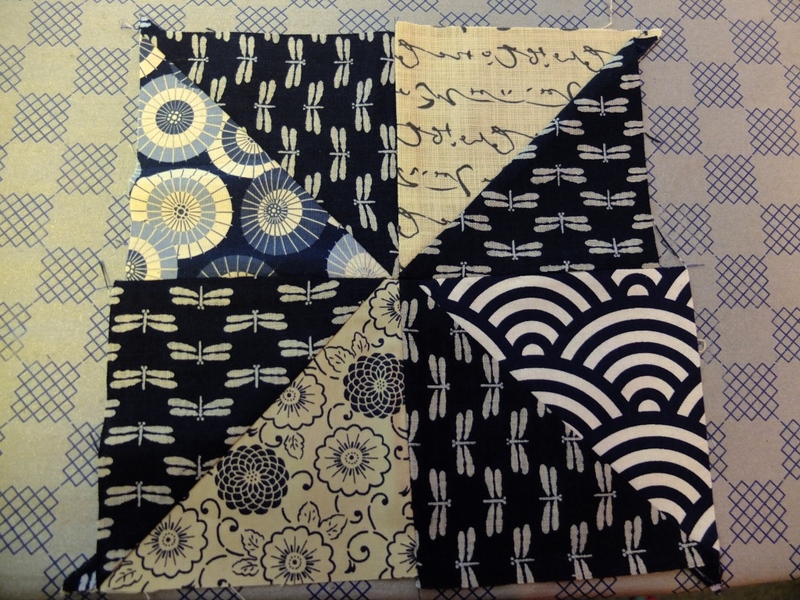 I also trimmed all of the Indigo Pinwheel blocks, and plotted out a layout for the quilt top. 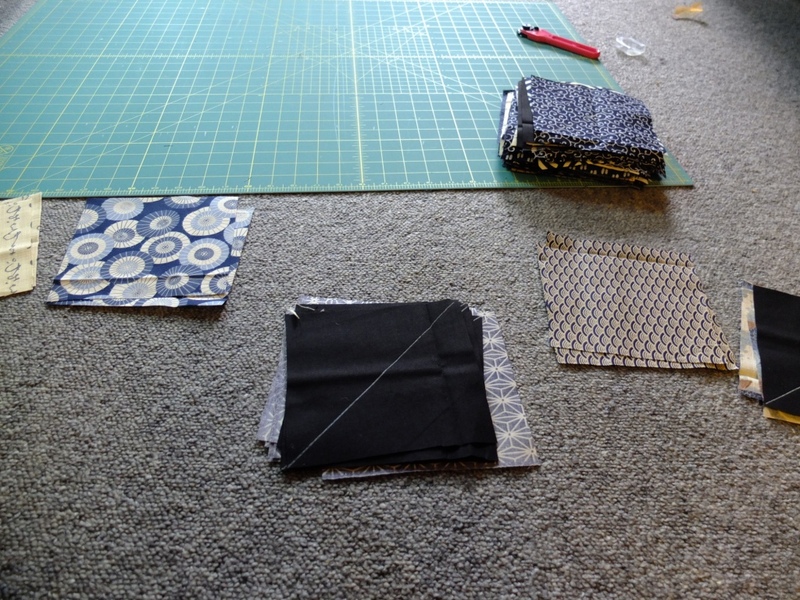 I tried to keep some semblance of order between predominantly light fabrics and predominantly dark. 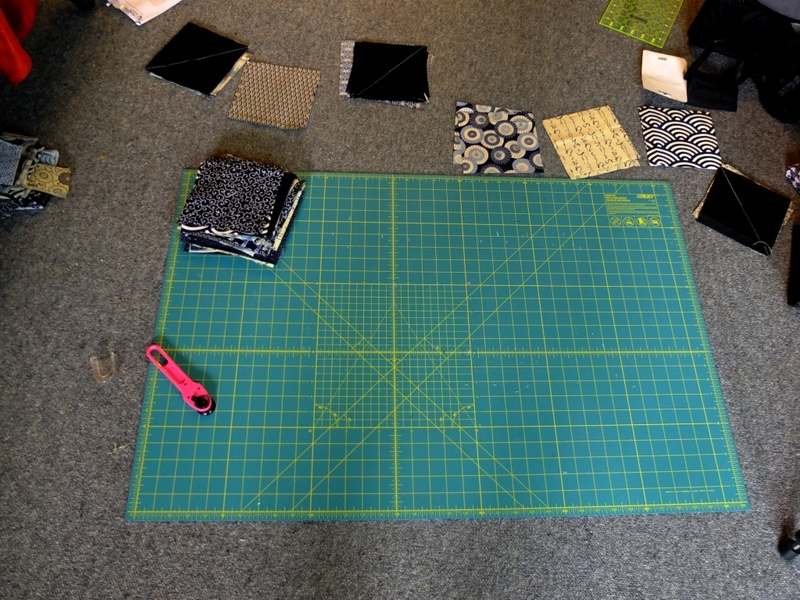 It is so nice having a decent amount of floor space to use to design quilt tops – before I was always stuck trying to wedge things into my too-small lounge room floor. I’ve sewn together the top, and tomorrow’s task is to suss out an appropriate backing and binding fabric. 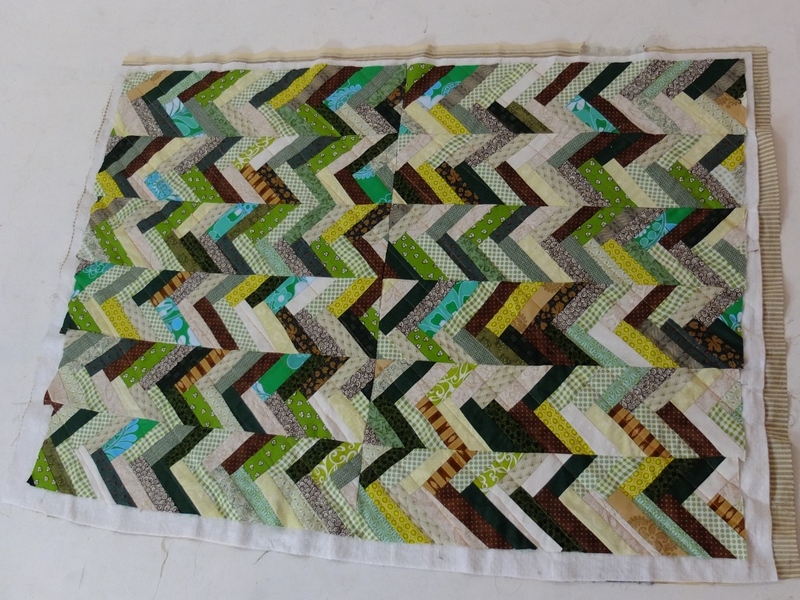 While sifting through the WIP box I also found this chevron quilt top I started years ago (literally years ago) and decided to have a go at finishing it up. 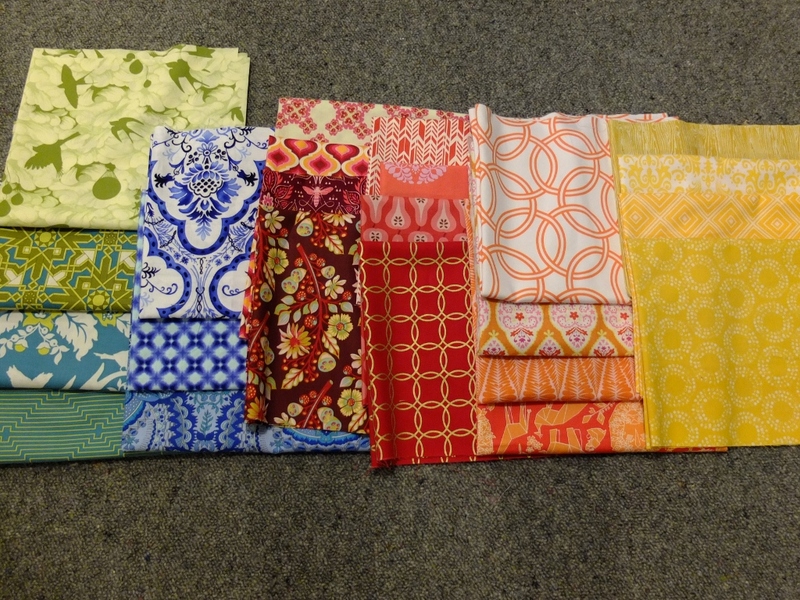 I’m not suuuuuper in love with the colours any more, but I don’t want half completed projects languishing in my stash much longer – I also have all the fabric already cut and it seems a waste not to finish it up. I saw someone on Pinterest refer to this pattern as a ‘french braid’ and I kind of really dig that. 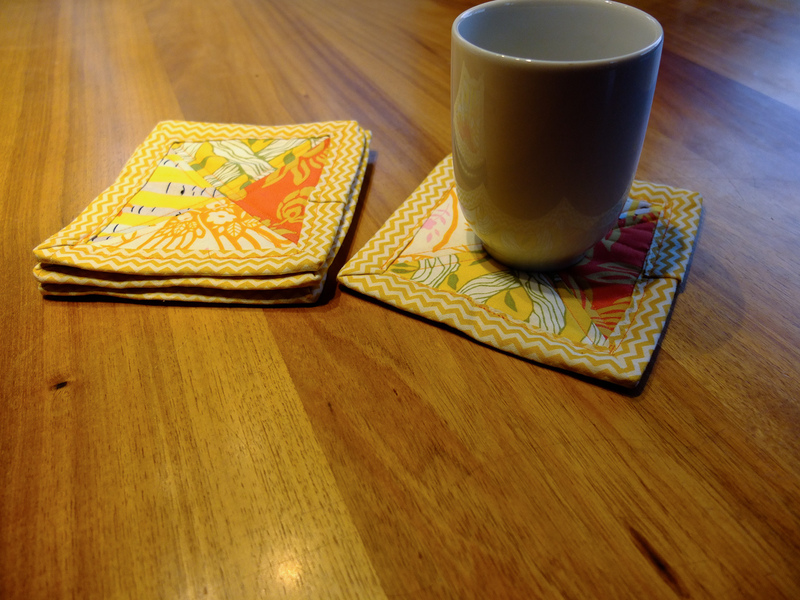 I also threw together a few more of these coasters using leftover squares from the chevron quilt. Greens! Triangles! 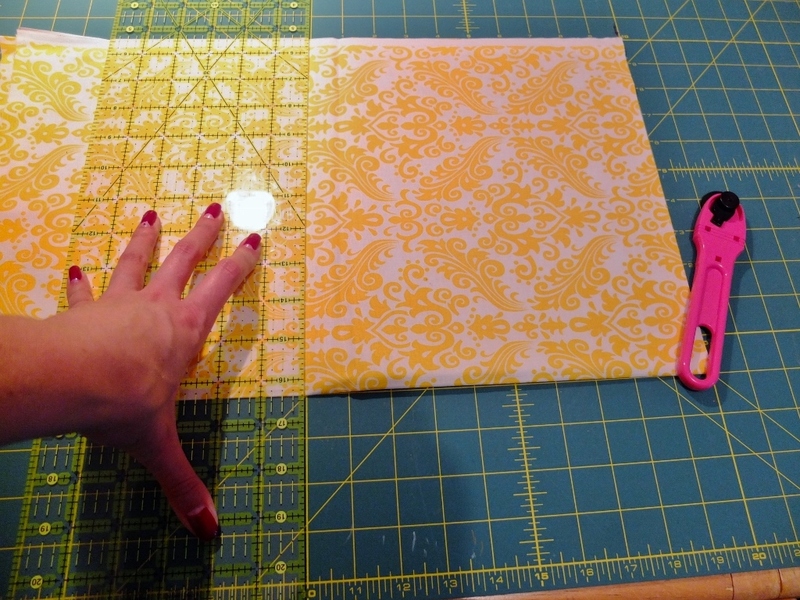 Binding which would be easier to sew with a walking foot! 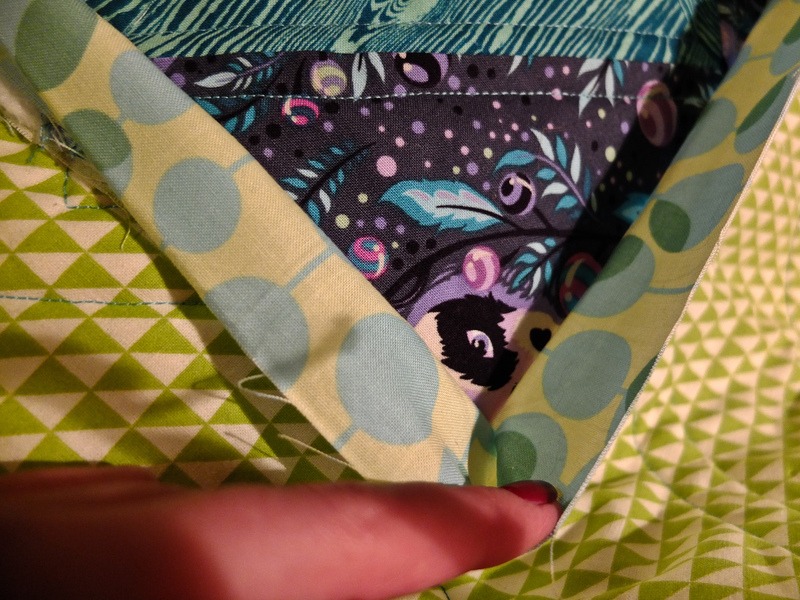 Speaking of my fabric stash though, I added some new bits and bobs to it the other day. I ordered a bunch of stuff off local Trademe seller which turned up cutely packaged. 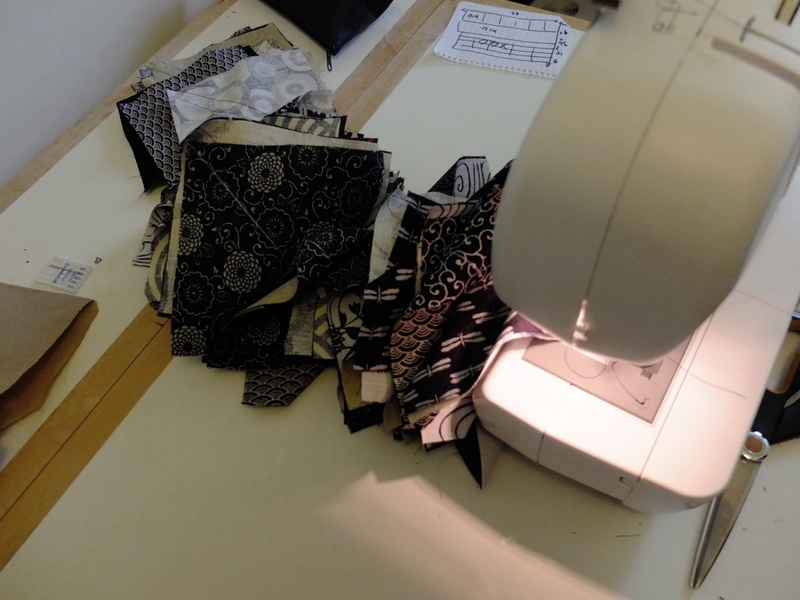 I also have a copy of Rotary Cutting Revolution: New One-Step Cutting, 8 Quilt Blocks on its way to me in the post which I’m quite excited about. I thought about grabbing a Kindle copy, but decided on balance I’d rather have a physical copy to put in front of me while I work. Hopefully it will have arrived by the time I write my next post and I’ll be able to let you know my first impressions! I’ve spent the last few weeks doing too much travelling, and also moving house both into a studio and a summer pad. My apartment needs a whole bunch of earthquake strengthening so it doesn’t go all dominos when New Zealand inevitably gets hit by the Big One. This has necessitated a lot of stress and a lot of wine drinking. 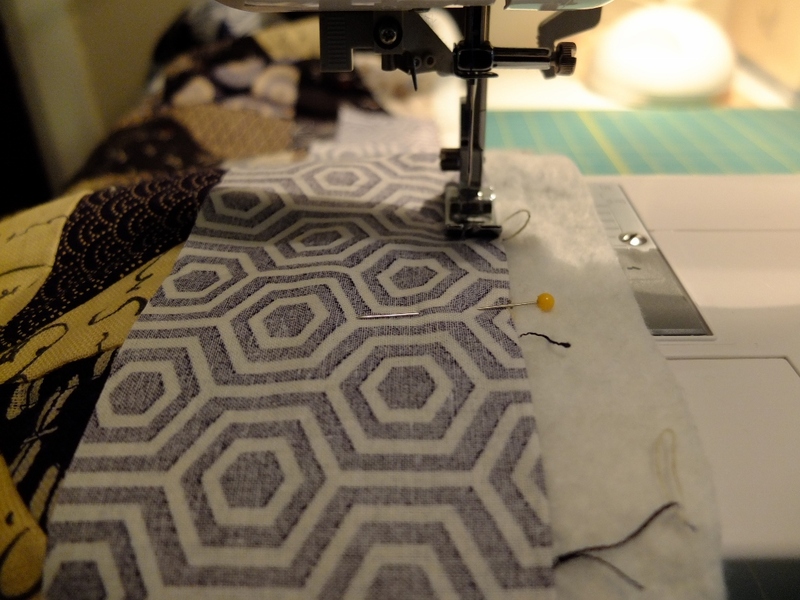 I have been trying to mitigate the stress by sewing in my new studio while drinking wine. 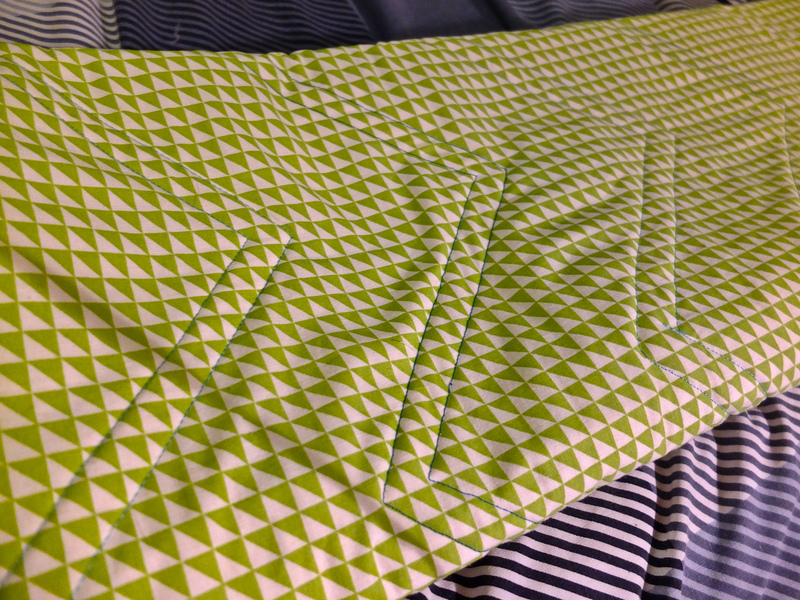 I’ve been working more on the chevron quilts, and also on the Fair Isle quilt-along.I’m horribly belong in the quilt-along, but I’m going to beg off that on account of having been away for 2 of the 4 weeks it has been running for. The poinsettas are almost done, to give you some indication of where I’m at. In keeping with my vaguely music blog leanings, I’ve spent a lot of time listening to Dio’s Holy Diver (thanks Alice for the suggestion). I’ve spent the last three days at home dealing with some family stuff which has come up. I was supposed to be staying with my Ma, but instead I’m staying with my parents. I’ve spent a lot of time feeling a bit useless because there has been nothing to do but wait for a time, and so I’ve gotten some sewing done. 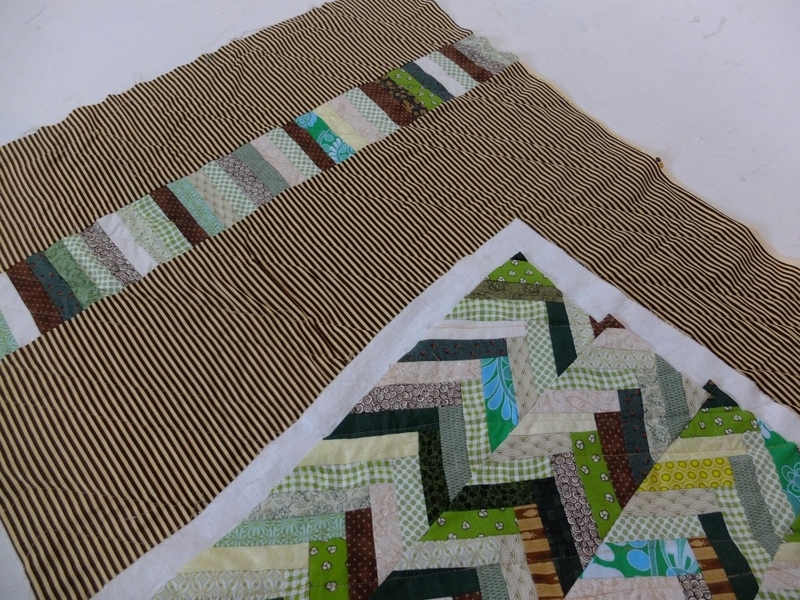 I’ve been quilting up the chevron quilts and all they have left is to hand stitch down the binding and they are ready to go to their new home. I quilted them with two seams on each side of each chevron alternating thread colours. 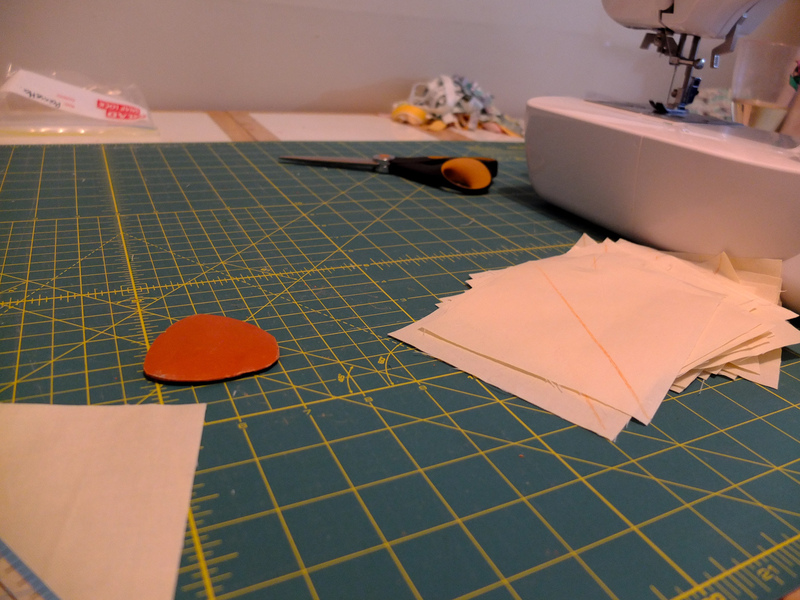 I didn’t mark the sewing line, just judged it by the edge of the foot. 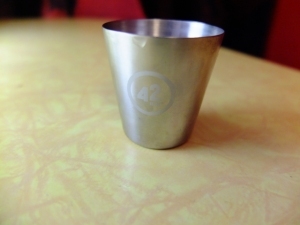 Functional and reasonably pretty. 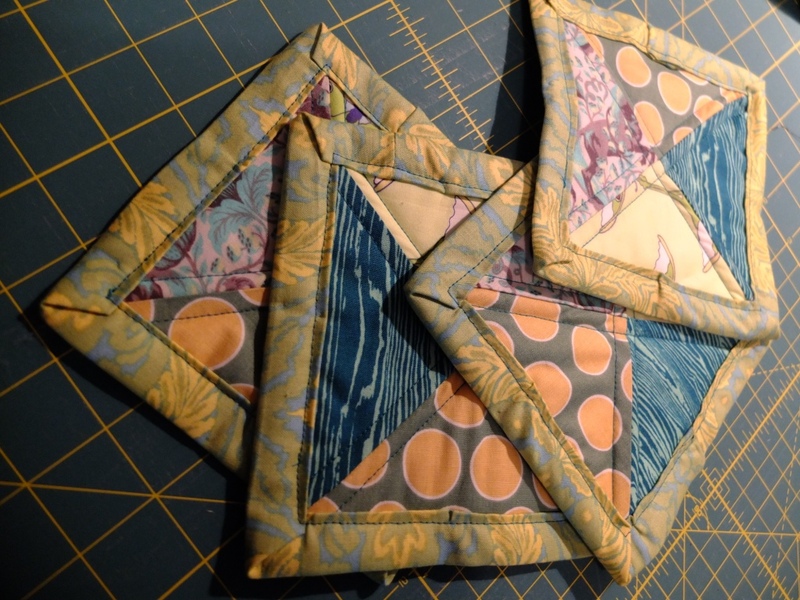 Among the sewing I’ve been doing has been some coasters from offcuts of the baby quilts. So far: the yellow and orange have been completed and I’ve resurrected my Etsy to list them if you are just desperate to own a piece of Megan Memorabilia yourself. I come bearing photos and also updates. I’ve made some headway into Freshly Pieced’s Fair Isle Quilt Along. 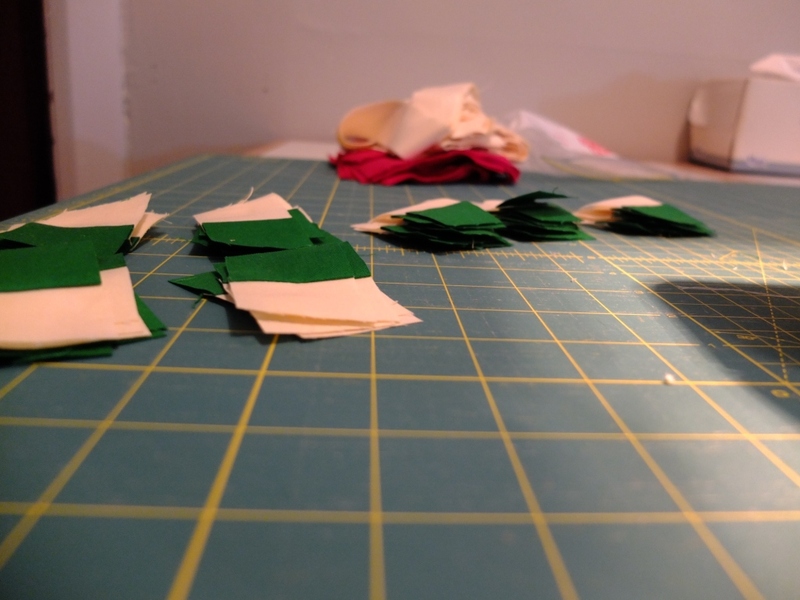 All my cutting is done and I’ve pieced probably half of the Poinsetta blocks. 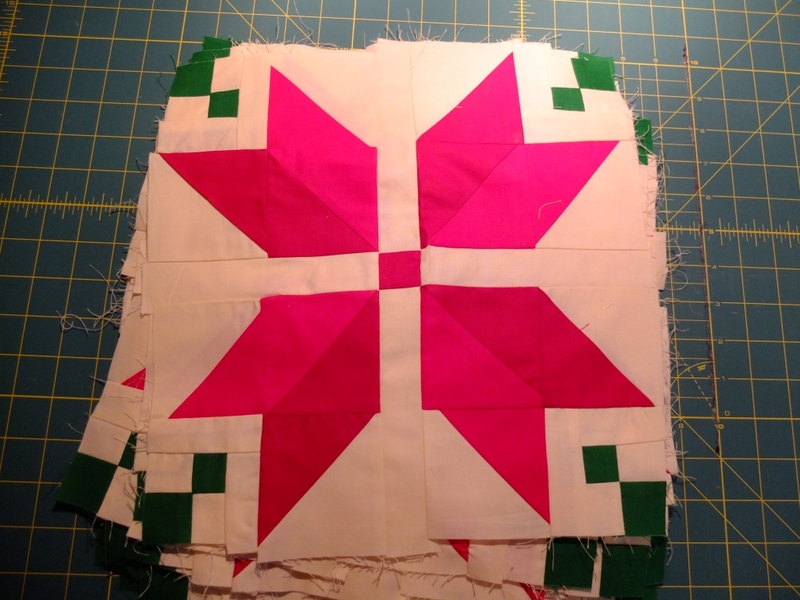 I’ve also sewn half of the all important Slayer block. Excuse the instagram-grab. Since I took this photo I’ve added the rest of the L, A and Y to the mix. 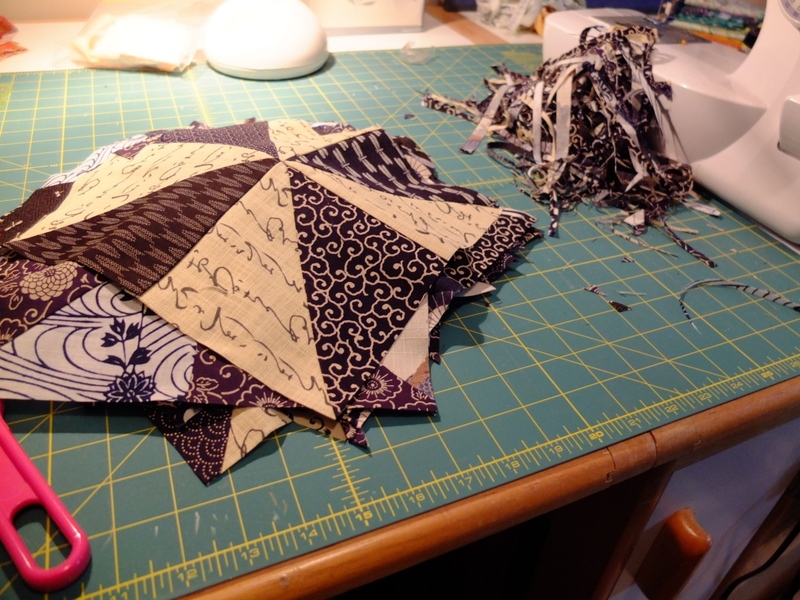 I didn’t exactly start paper piecing with an easy option, but it’s going alright so far. 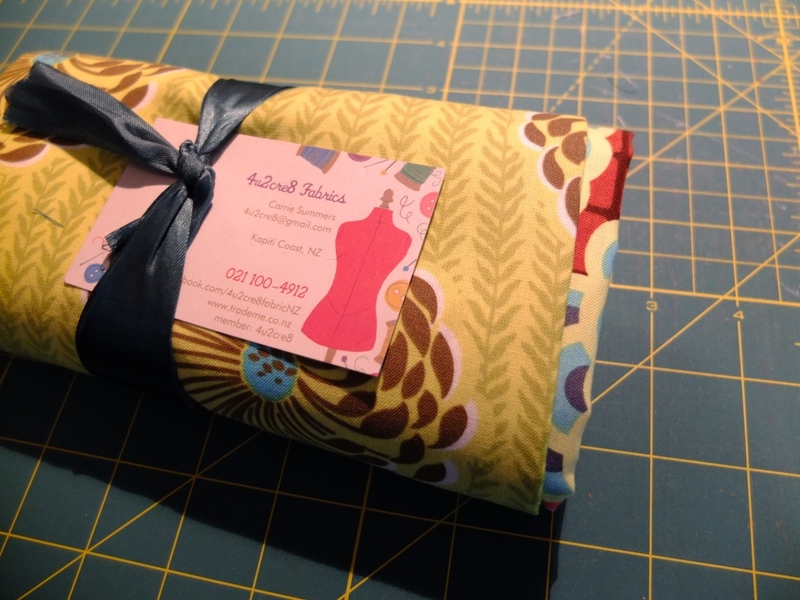 I’m enjoying having something to carry around and sew as I go. 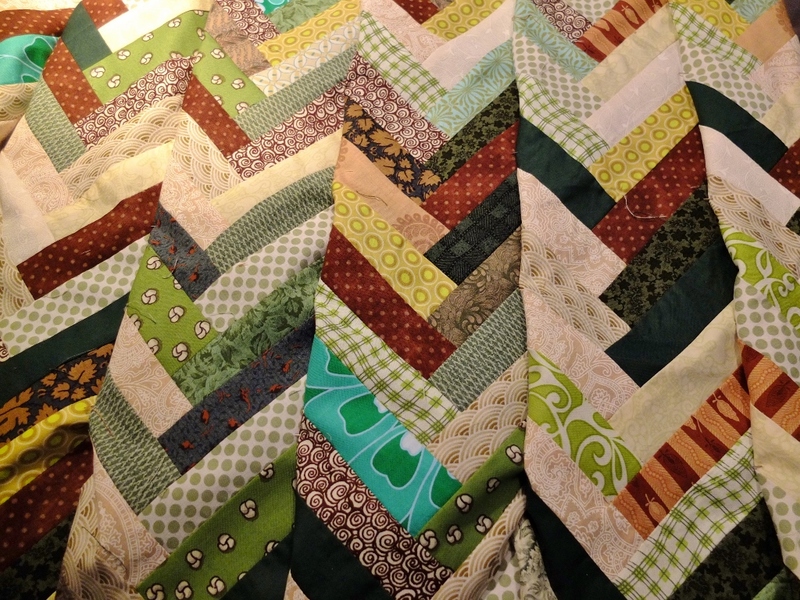 I also followed Lee’s advice and chain pieced everything. 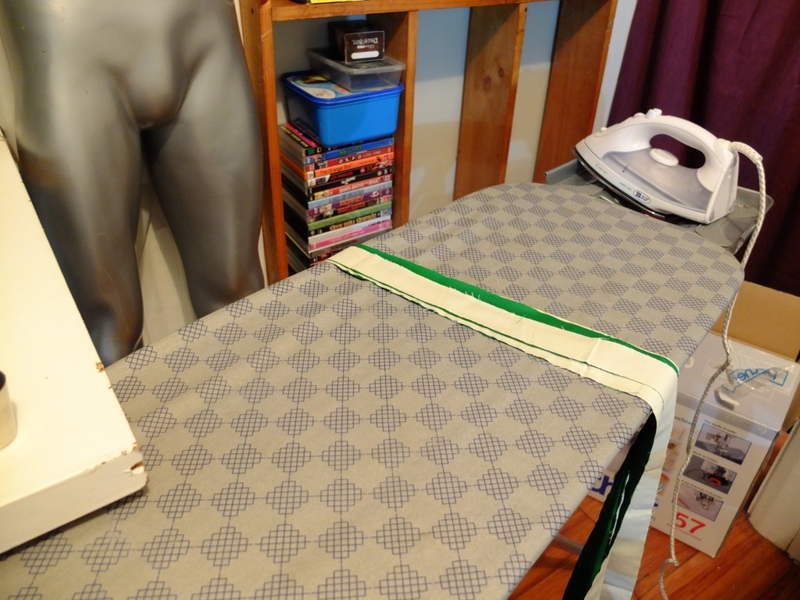 I moved into my new studio and as you can see from the photos, my sewing is being watched over by David Bowie’s crotch (or David Bowie’s Area as proponents of Areology would have it). Also, studio! Please note the all important bottle of wine. Oh frabjous day. I can leave my stuff out and come back to it the next day. I’m inordinately pleased by this. 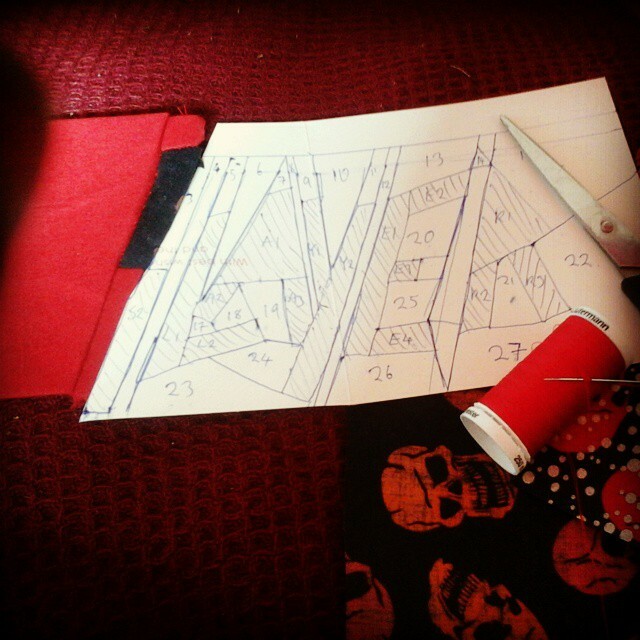 I haven’t had a dedicated space for sewing since I was 17 and co-opted out shed for it since it was full of disused tractors and abandoned renovation projects. 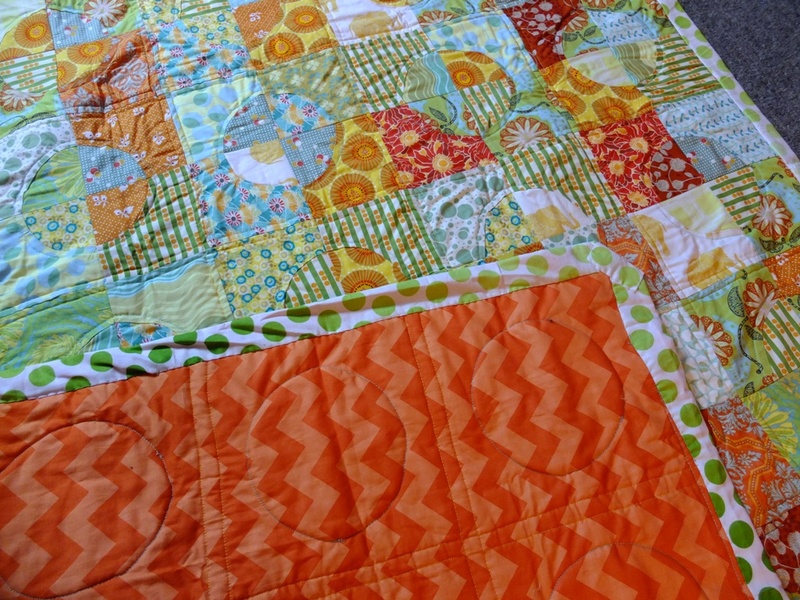 I’ve made the most of the space by starting the chevron quilts I mentioned in my last post. 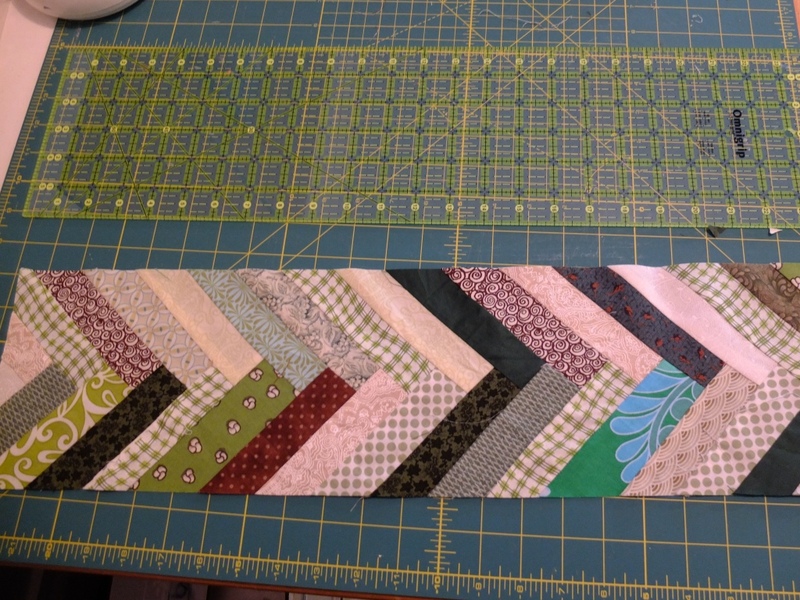 The top of one is finished, and the other has been cut but has to be sewn into HSTs still. 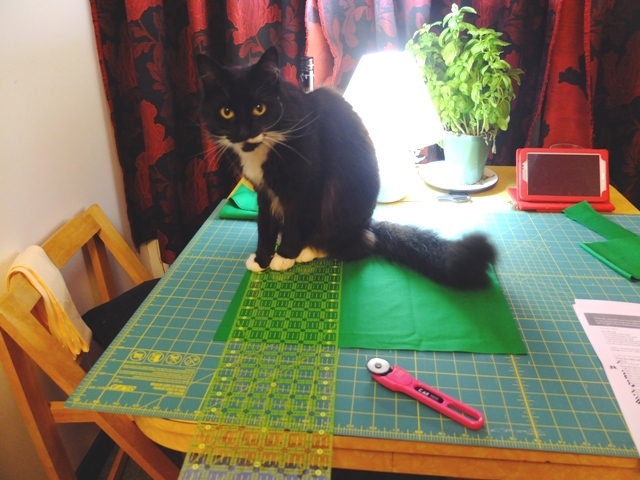 I’m going home to stay with my Grandma next week so I plan to take both with me then and hopefully complete the quilting and sew on the binding while I’m away. Grandma is usually knitting something and it’s really nice to have a companionable silence while we’re both being productive and creative. 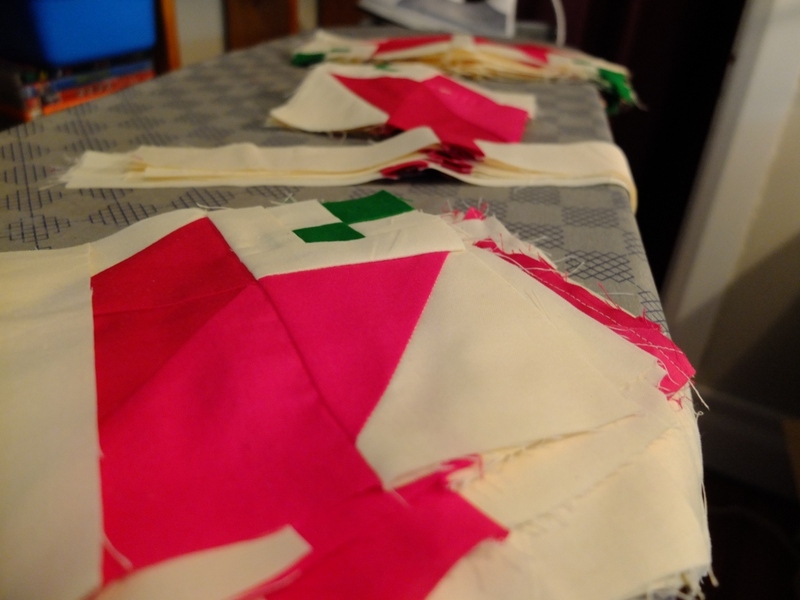 Here’s the half square triangles in the midst of piecing. 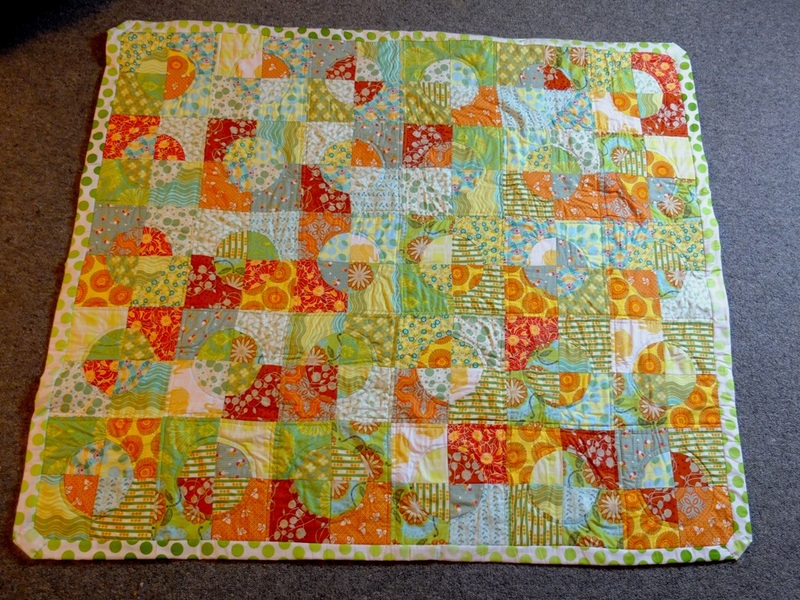 And the quilt top. 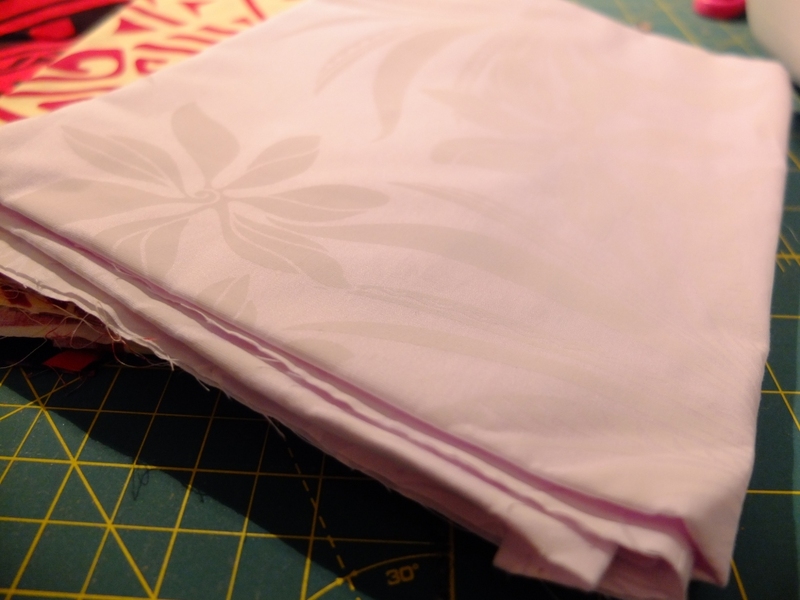 I wound up using a different tutorial than the one I mentioned initially just because of the size of the fabric lengths I bought. My other project since I last posted as been a little snood for a doggy. 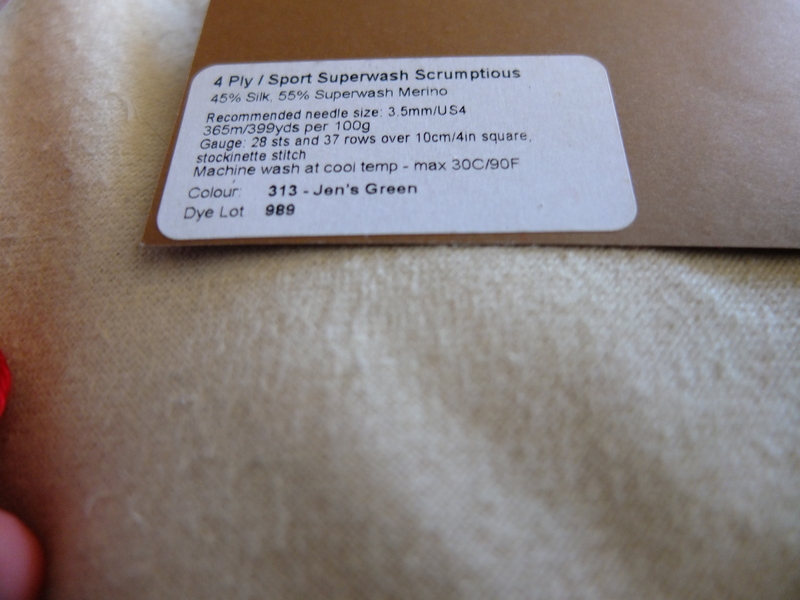 A nice dusky blue, also from Morris and Sons (after I finished off the red cable scarf – pics to come). 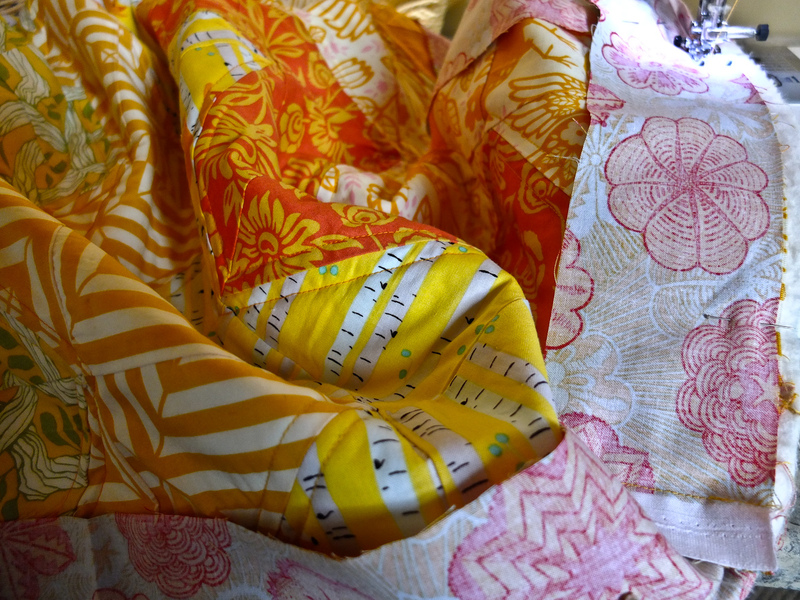 Here’s the start of it – hopefully I can furnish you all with some photos of a dog in a scarf before long. I’ve also been researching semi-industrial machines and I’m eyeing up the Brother PQ1500s. Does anyone have feedback about it, thoughts positive or negative? I’m home! Finally. 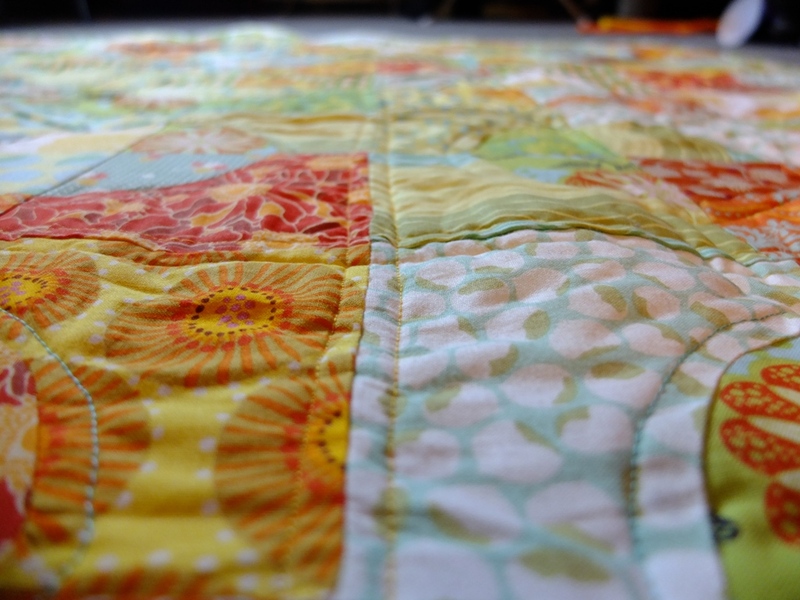 And I have taken some more photos of the delightful circle/drunkards path quilt before it goes off to its new home. It was made for a friend whose new babe was born some months ago now, because I am a bit slow with these things sometimes, but conveniently it was her birthday a week ago, so I can probably pass it off under that guise and appear slightly less crap. 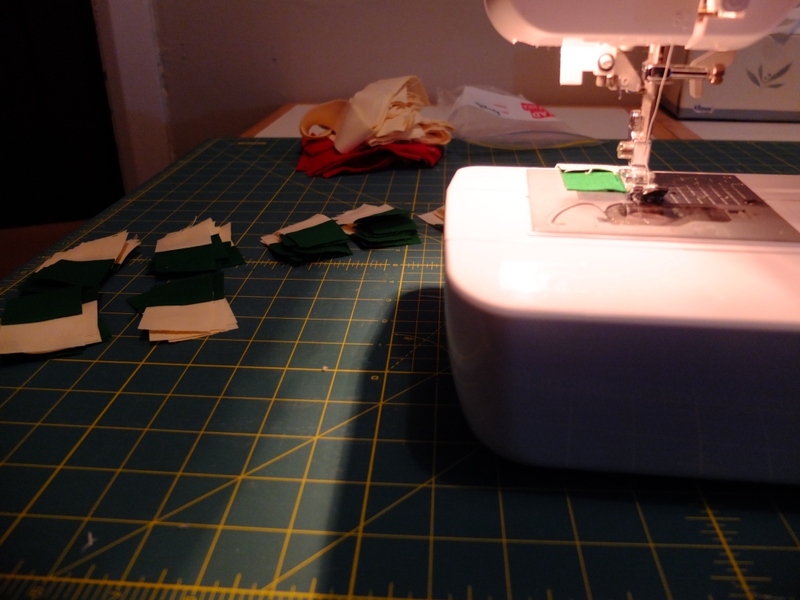 I’ve been thinking a lot about quilting, and sewing and repetition. About what it means to give someone something handmade. All the thoughts have been churning around in my head for weeks, so expect this idea to be revisited and refined in future posts, but for now I want to talk, briefly and terribly, about repetition. Repetition as a concept has shown up a bunch in my studies. In my art history papers, because repetition is a key feature of art – performance art in particular. It also figures heavily in a lot of the Media Studies papers I’ve written. It crops up in a lot of Butler’s writing, about identity. 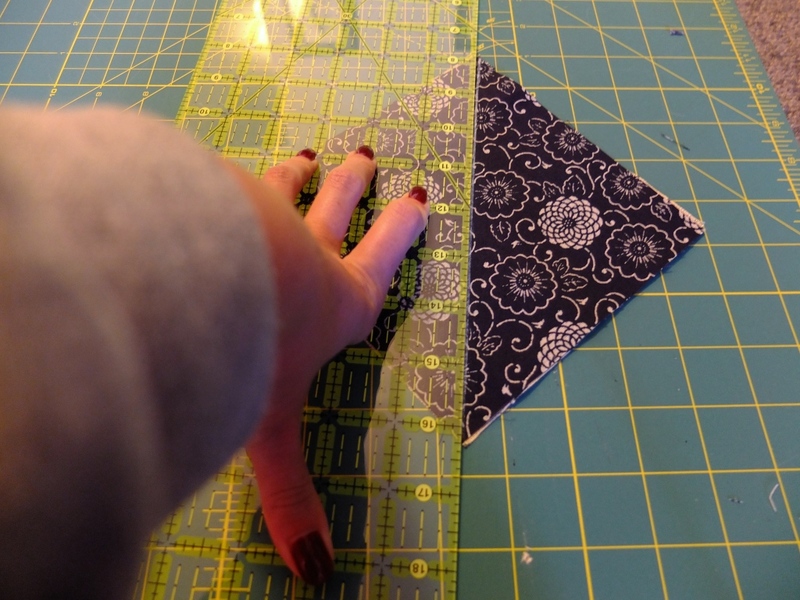 This is probably the most academically vague and lazy thing I’ve ever allowed other people to read, but I’m curious about repetition in handmade items, handmade gifts. 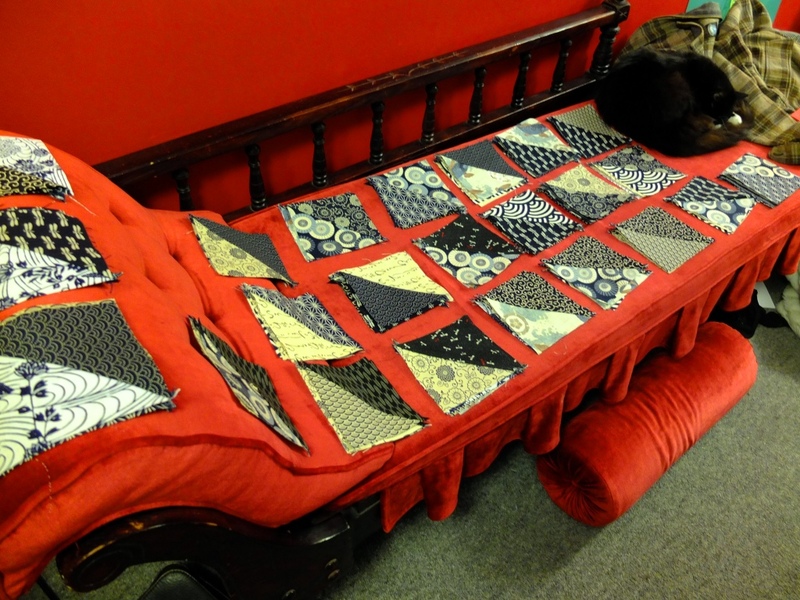 A quilt comprises hundreds of hours of cutting, sewing, breaking down large pieces into smaller bits then rebuilding them. 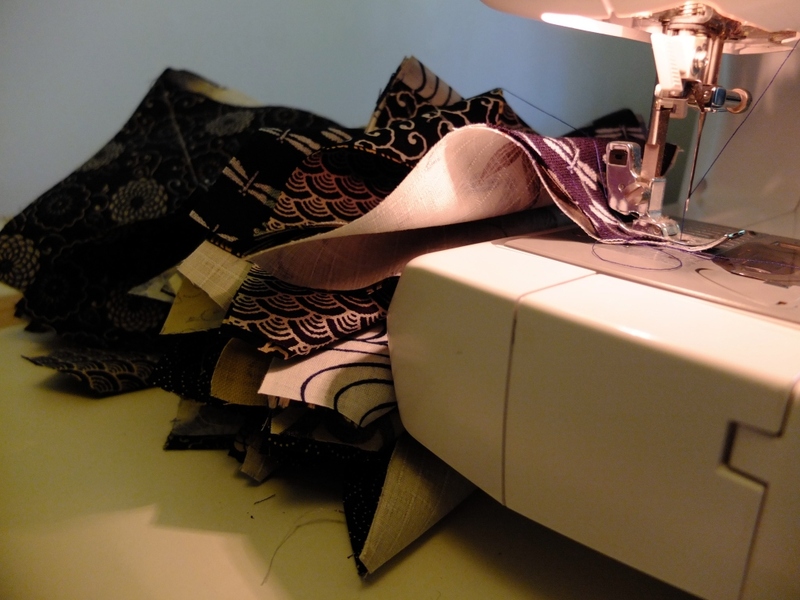 There is a repetition to the cutting and sewing which imbues the finished product with meaning. 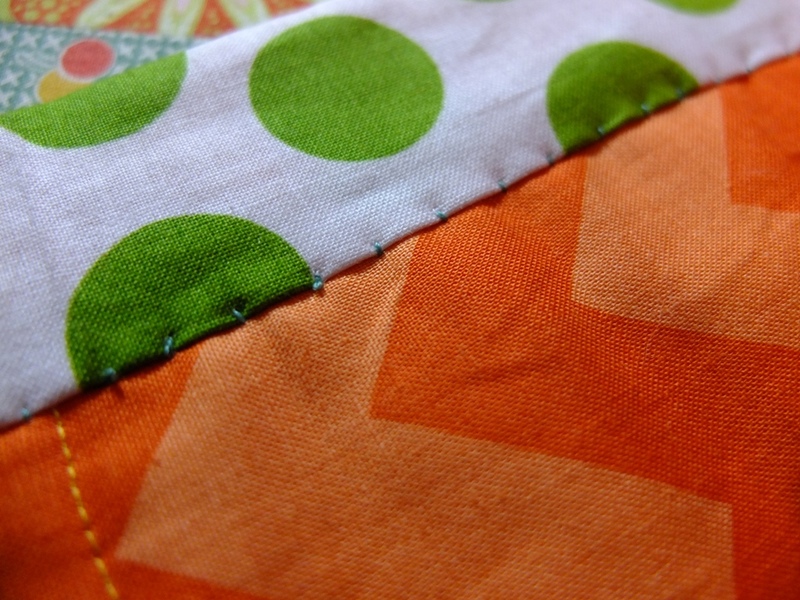 A quilt isn’t just a gift of a blanket, it’s an indication that the recipient means enough to you to warrant a hundred hours of pricking yourself with another sodding safety pin. 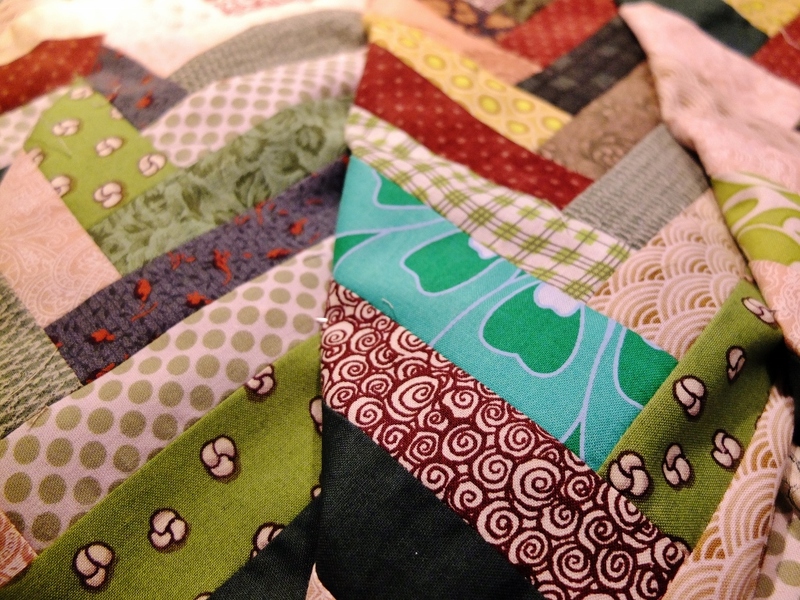 I feel (hope) that sometimes a quilt/knitted something can be a reminder that there are people who care about you. 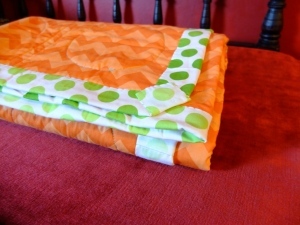 A quilt isn’t just a blanket, it’s a tangible ‘you can ask other people for help and many will gladly give it’. Wrap yourself up in a hundred hours of work from someone who had never met you, but was willing to be that when you appeared, tiny and screaming in the world, you would be a good person worthy of love and something cozy for the cold nights. 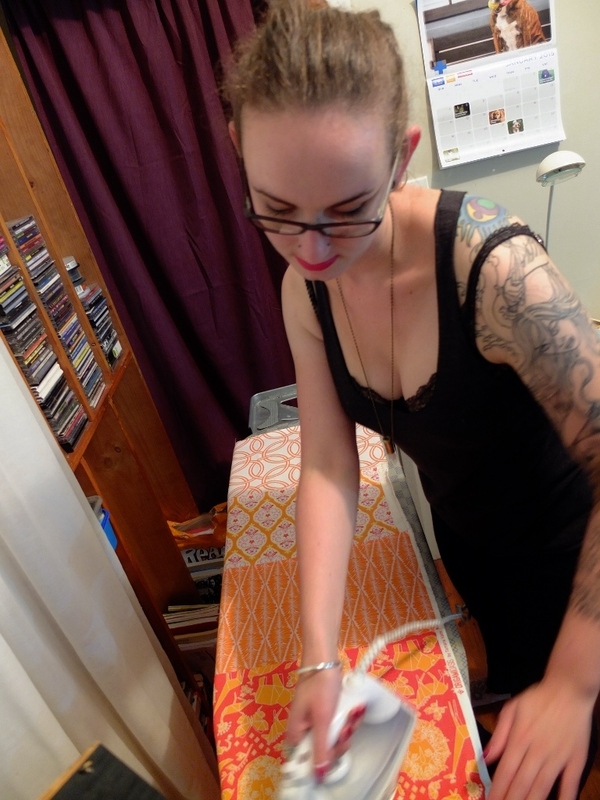 My dreams of a studio, alas, have not come to fruition – so I’m still taking photos on my lounge room floor, strategically cropping my slippers out of the frame as I hold the camera above my head. 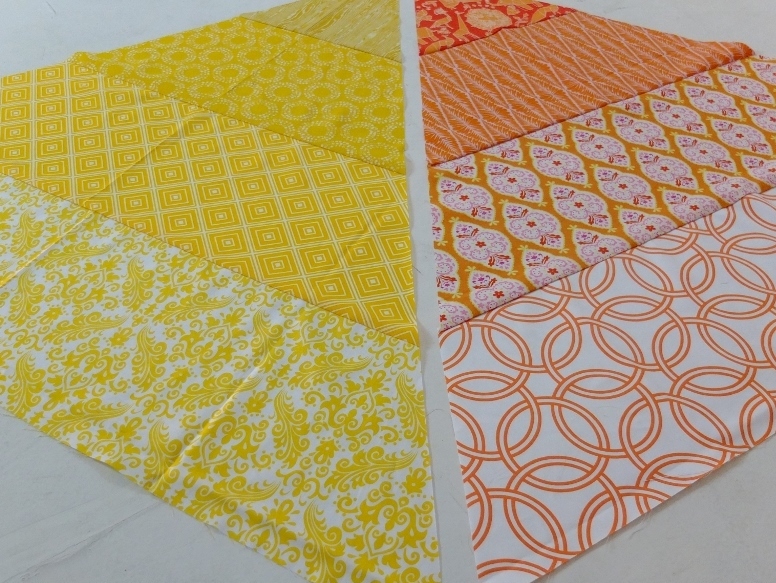 I’ve started on a new quilt using the Japanese cottons from my last post and I’m waiting for my finances to pick up a little so I can order some fabrics for matching baby quilts. 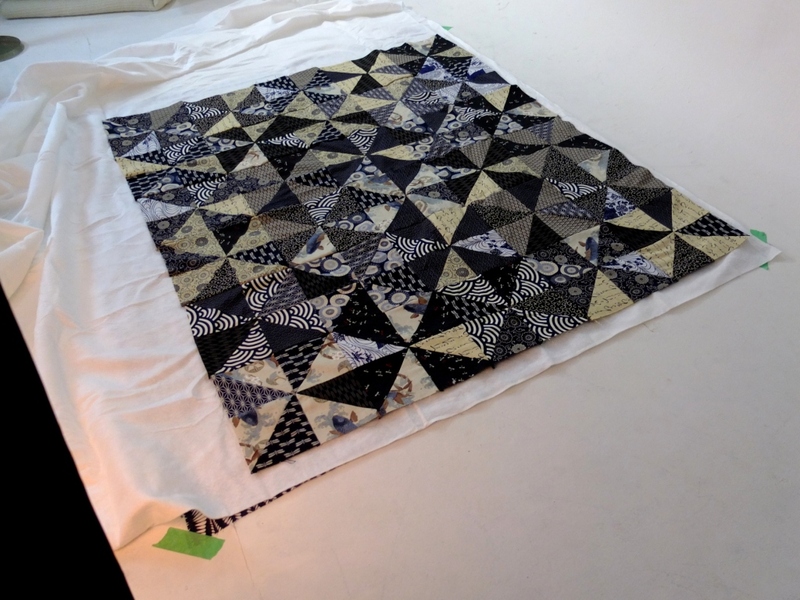 Someone (I forget who – if you know please let me know in the comments) wrote a while back about mixing saturation and using that to distinguish light and darks and create visual interest in quilts. 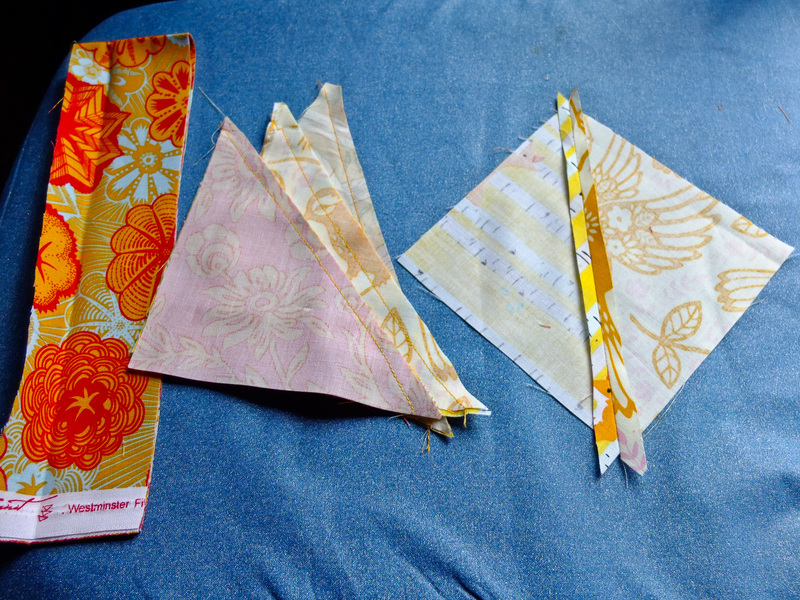 I’m broadly grouping my fabrics into lighter/darker and making pinwheel squares from them. I’m excited to see how this comes together.